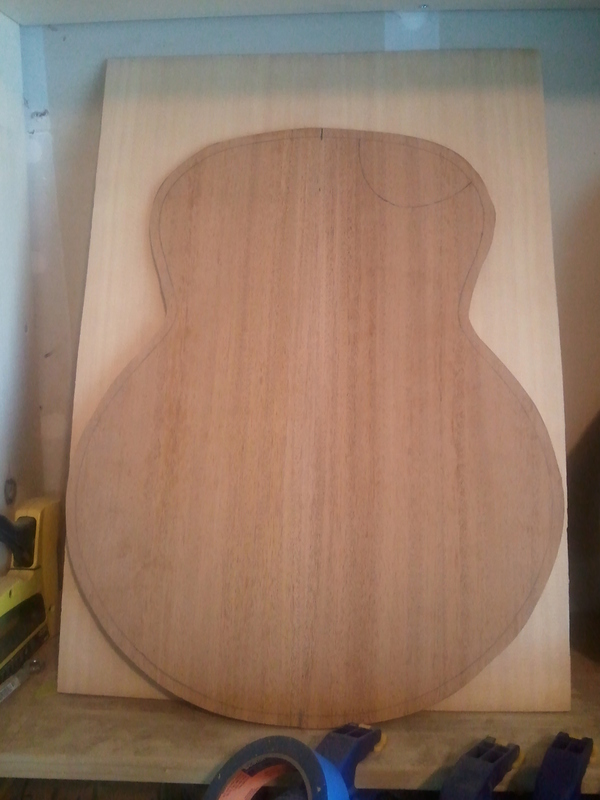 I worked a bit on this one. 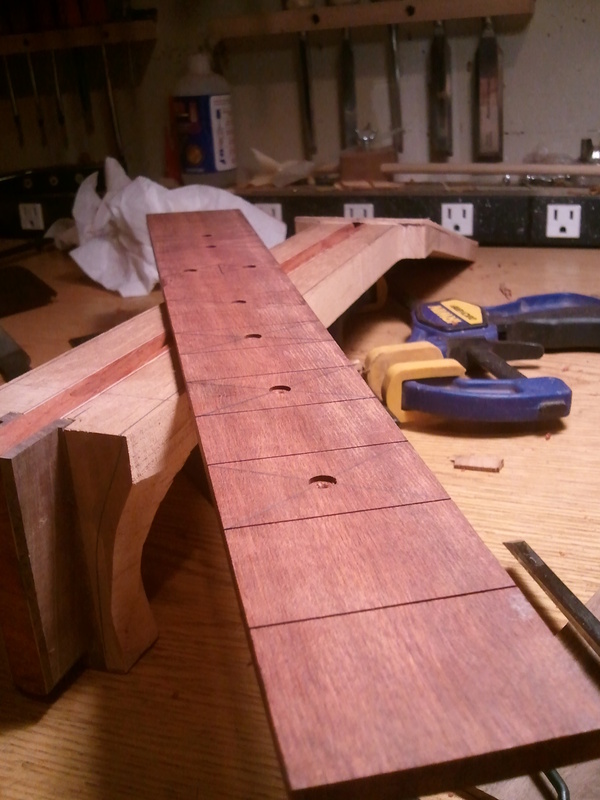 I routed the binding channels for it. 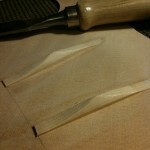 I had to order more purfling before I bend and install the bindings though. 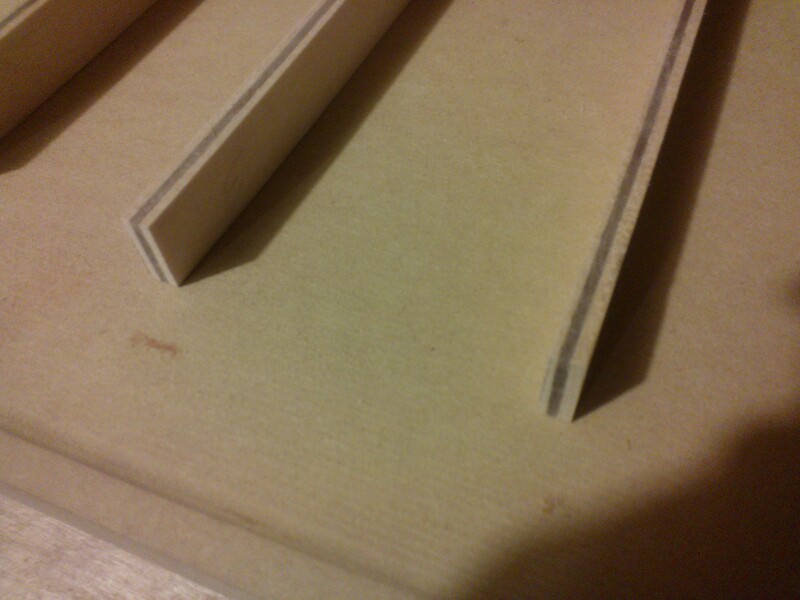 #8 Update, Box closed up! 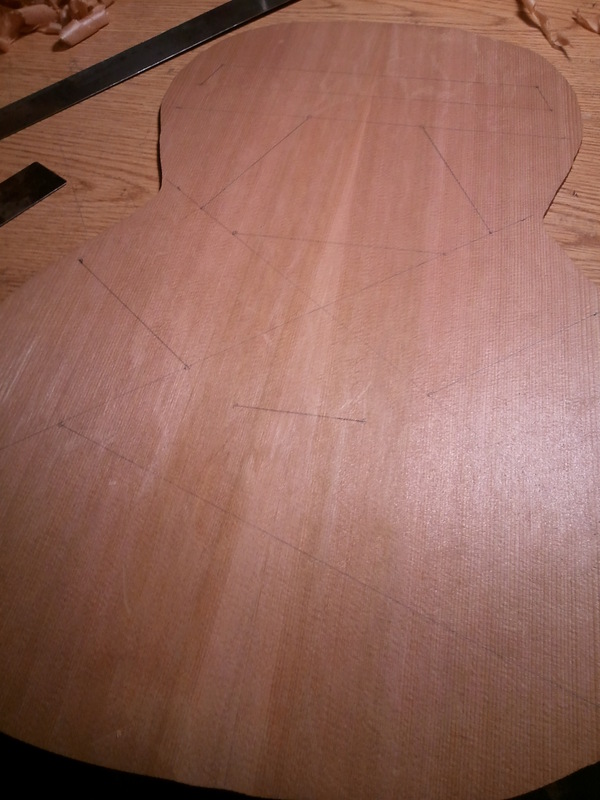 I got #8 closed up. 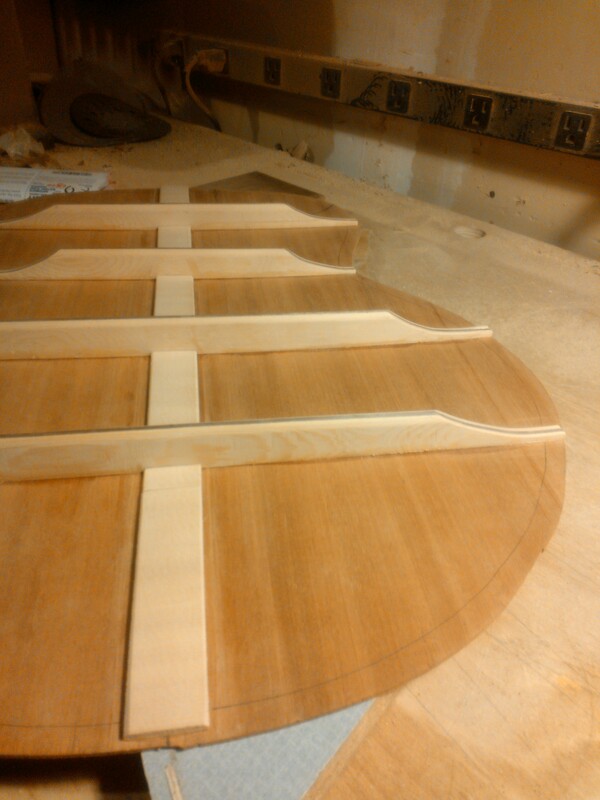 I’ve been finding lots of time to work on it in between wrestling with the finish on these other guitars. 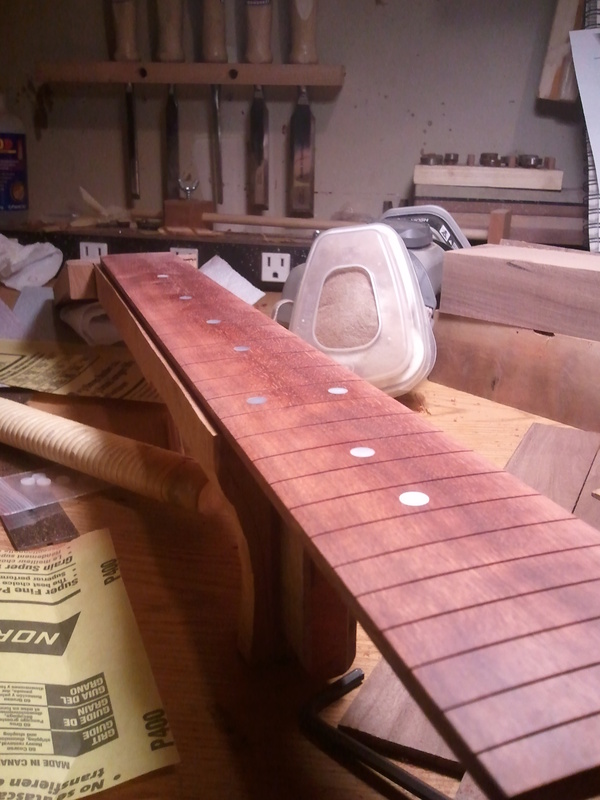 It’s coming together nicely, I think. 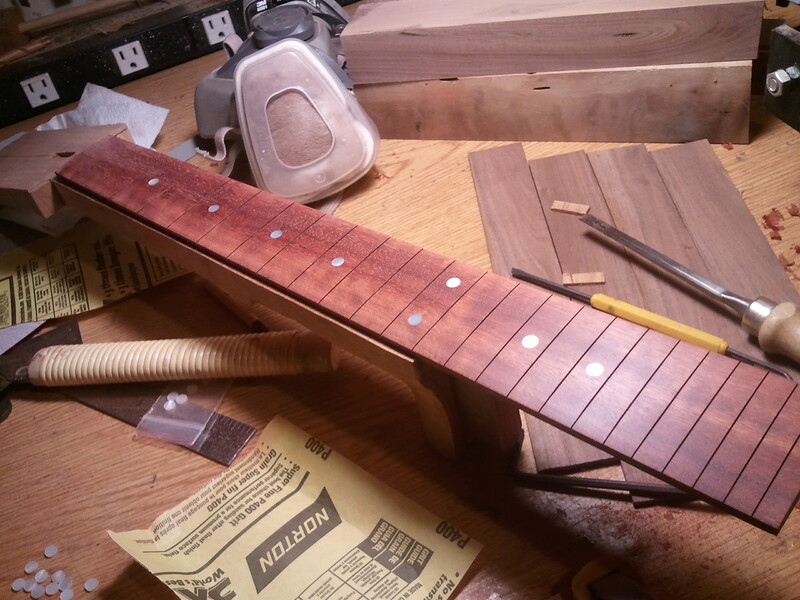 I’ve been neglecting this one for awhile as I’ve had higher priority builds. 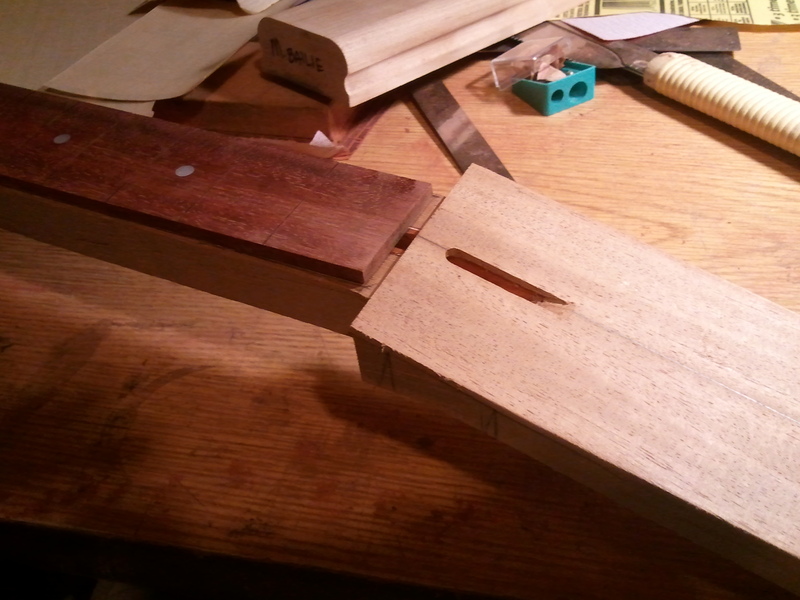 But now those builds are sitting around curing, so I have time to develop my first cutaway! 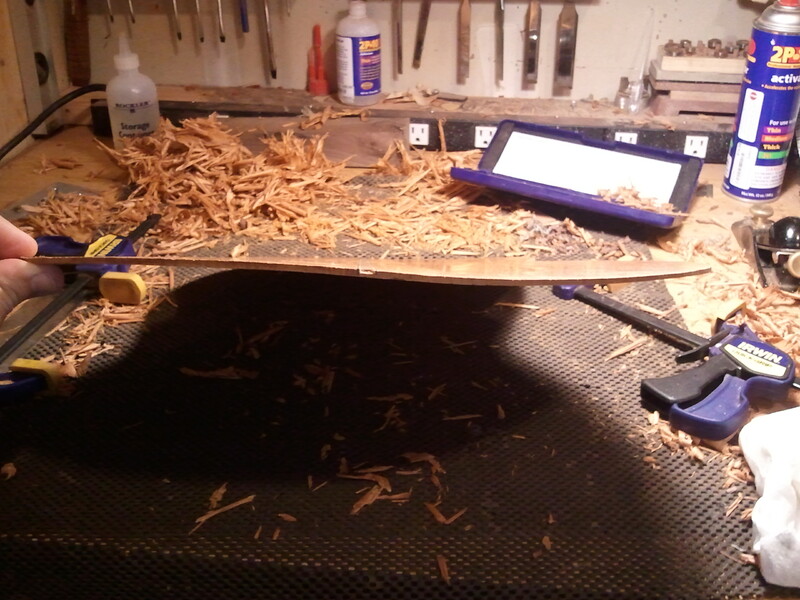 I got a fair amount of work done on it. 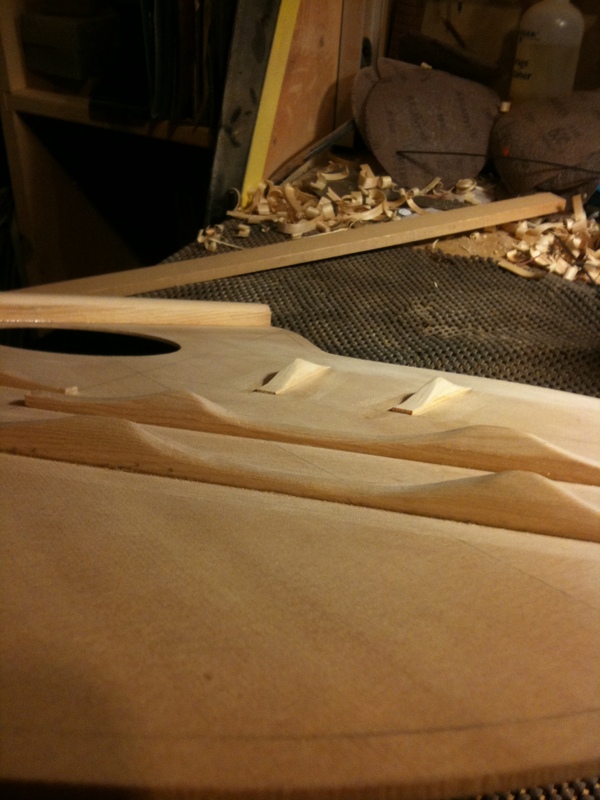 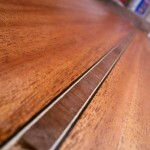 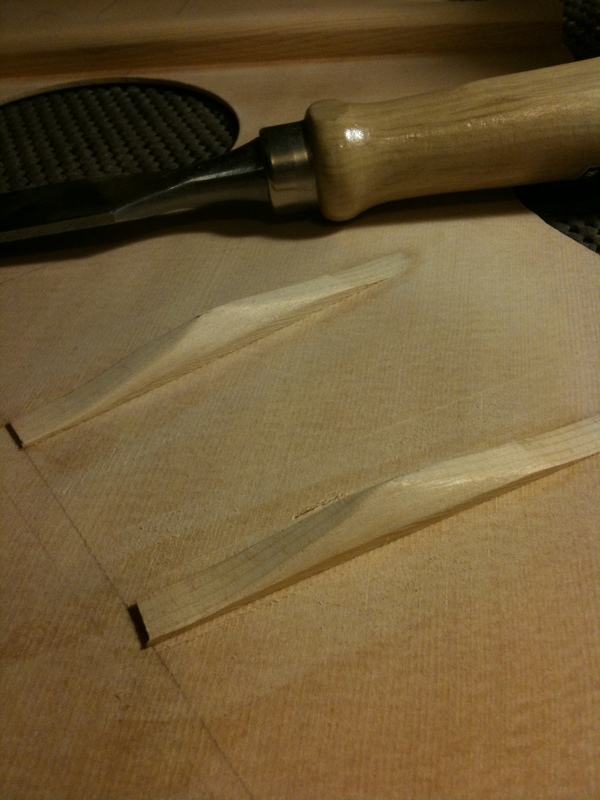 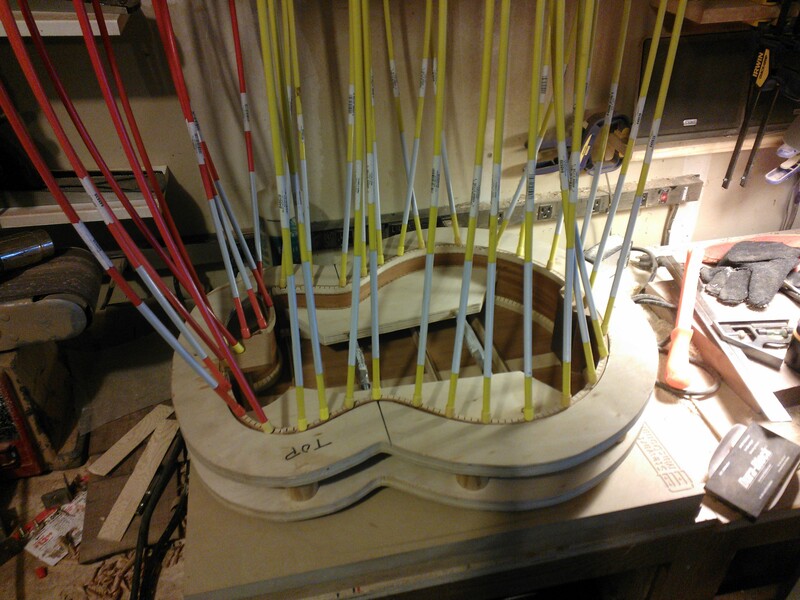 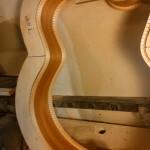 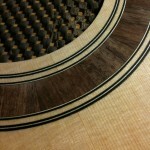 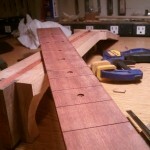 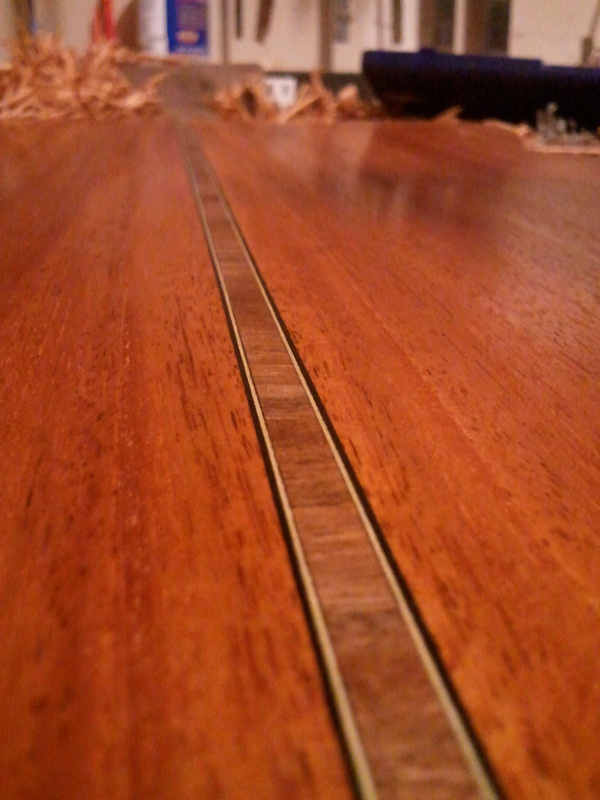 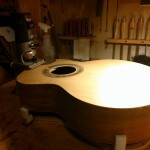 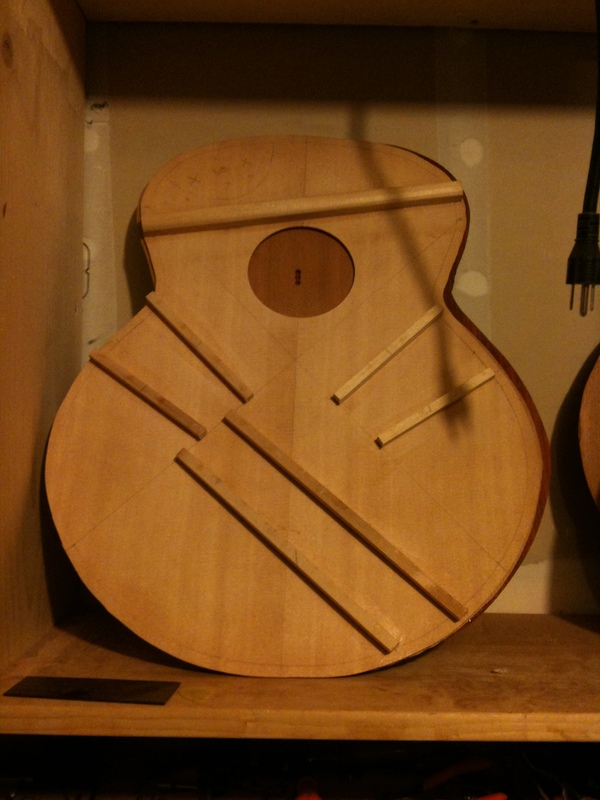 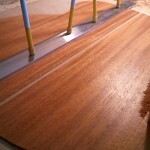 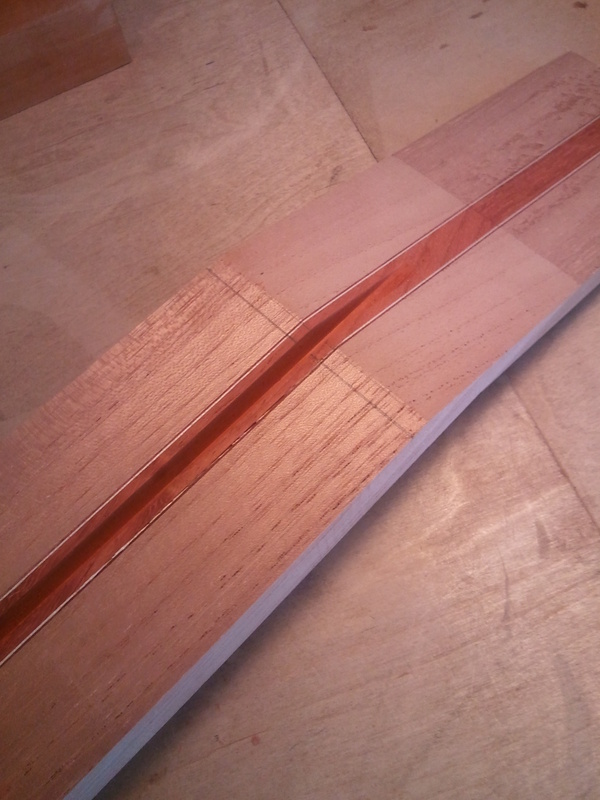 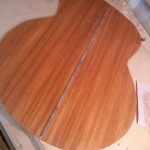 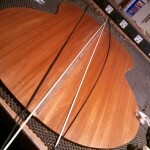 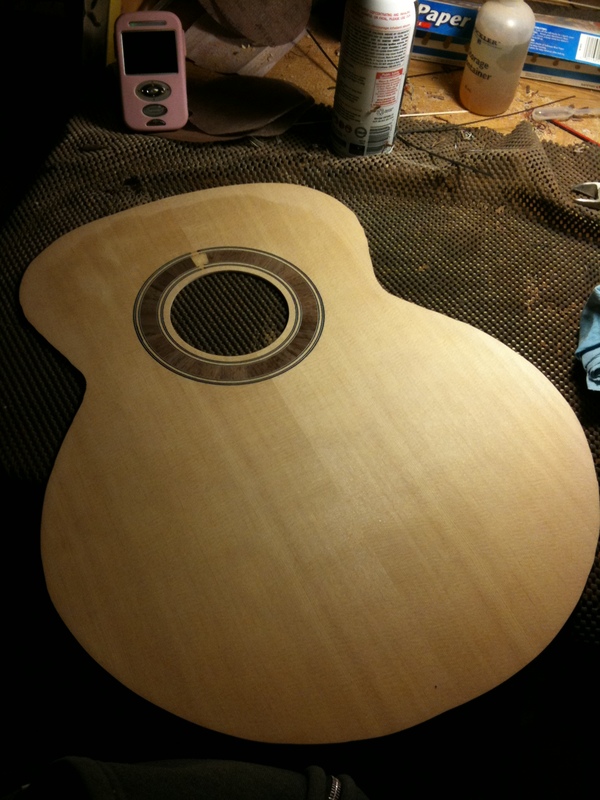 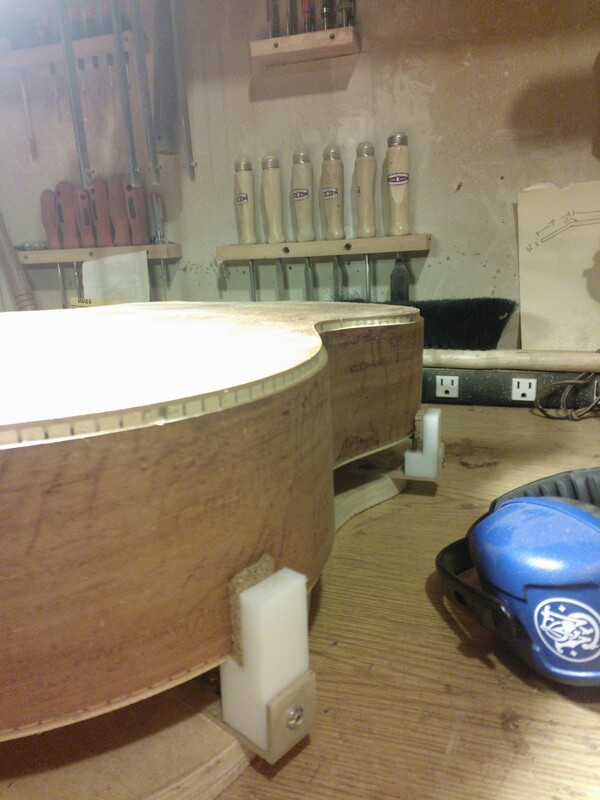 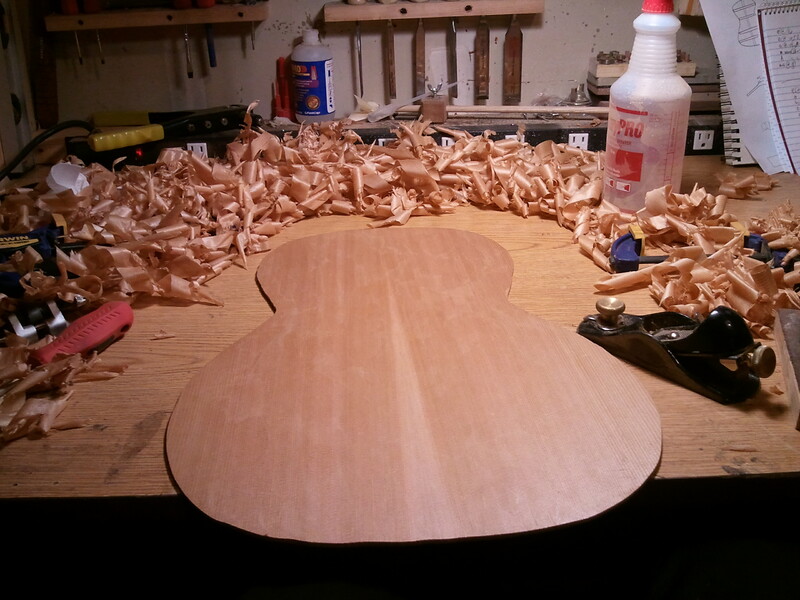 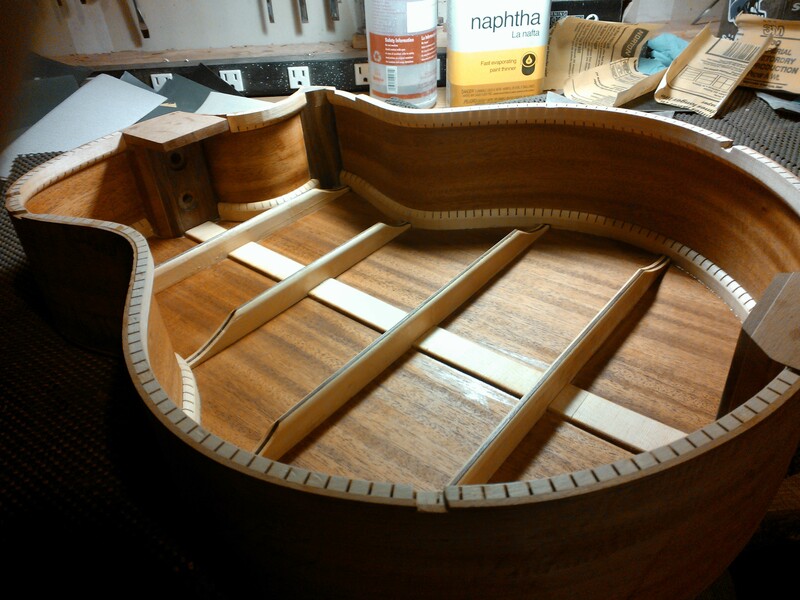 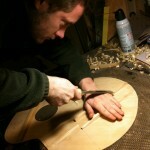 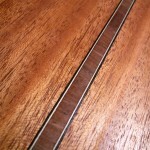 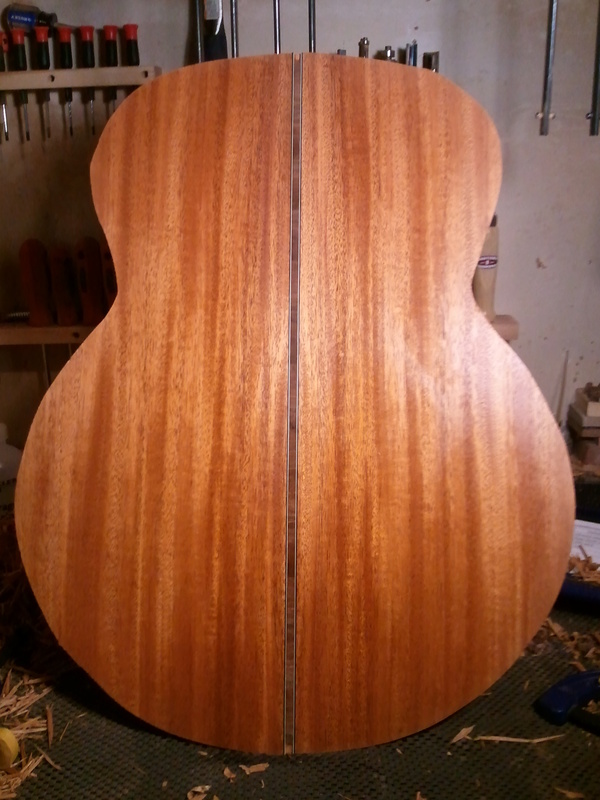 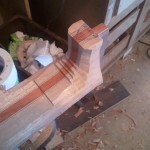 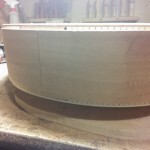 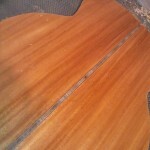 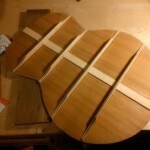 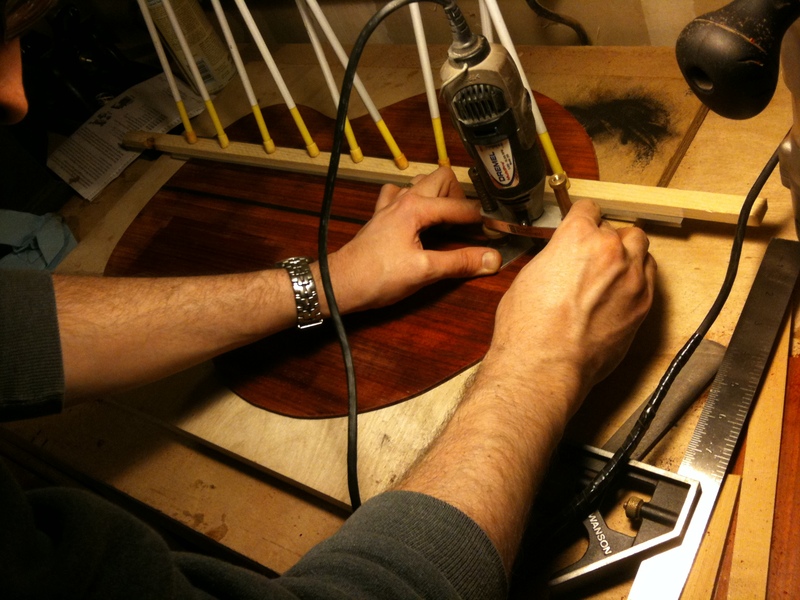 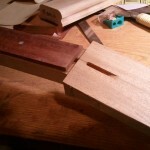 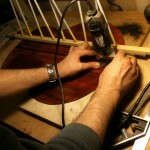 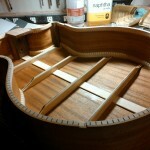 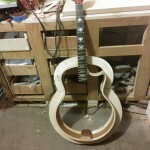 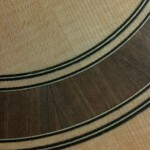 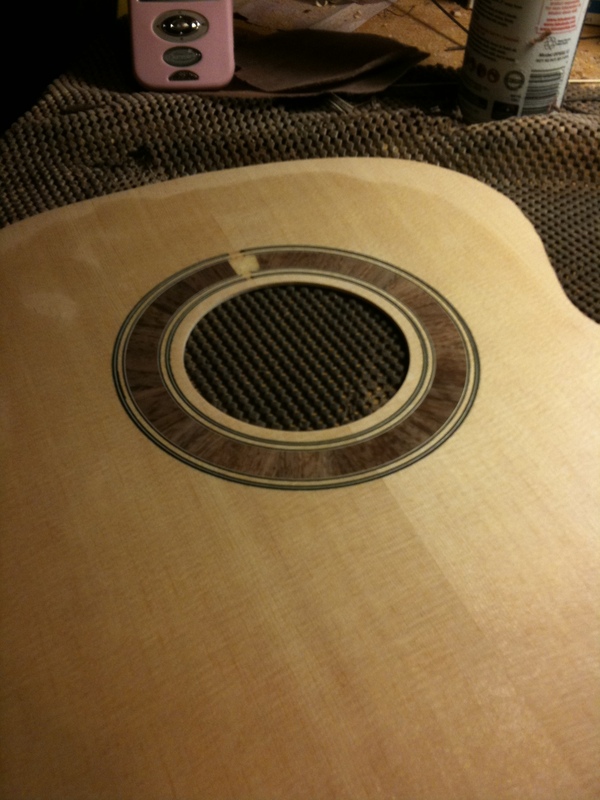 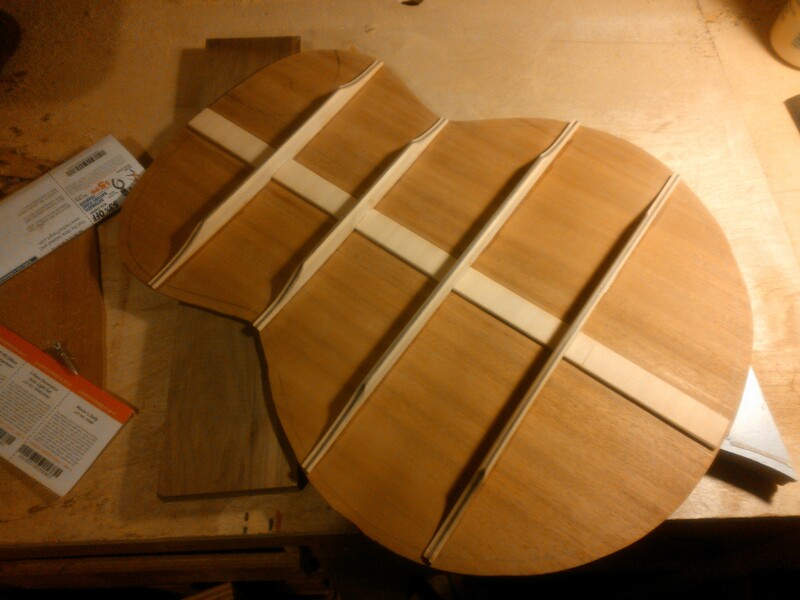 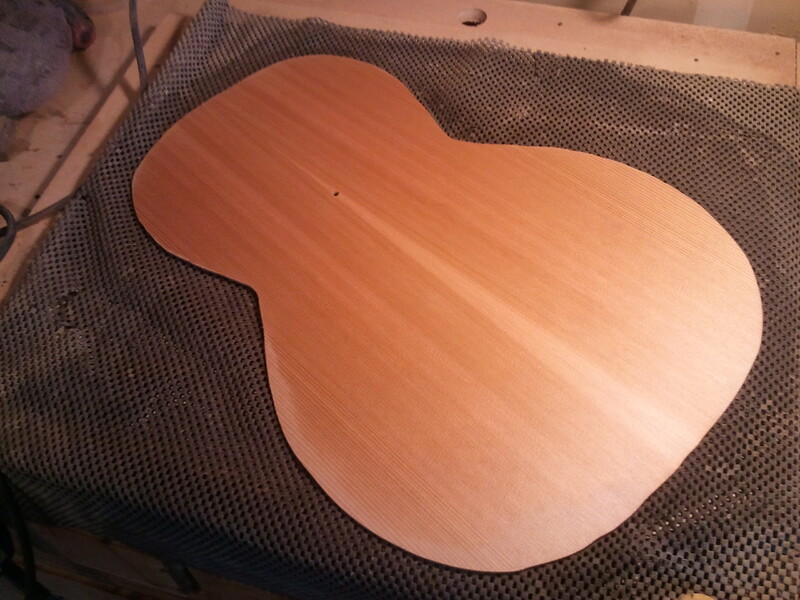 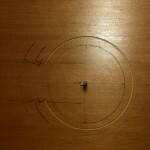 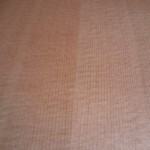 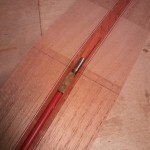 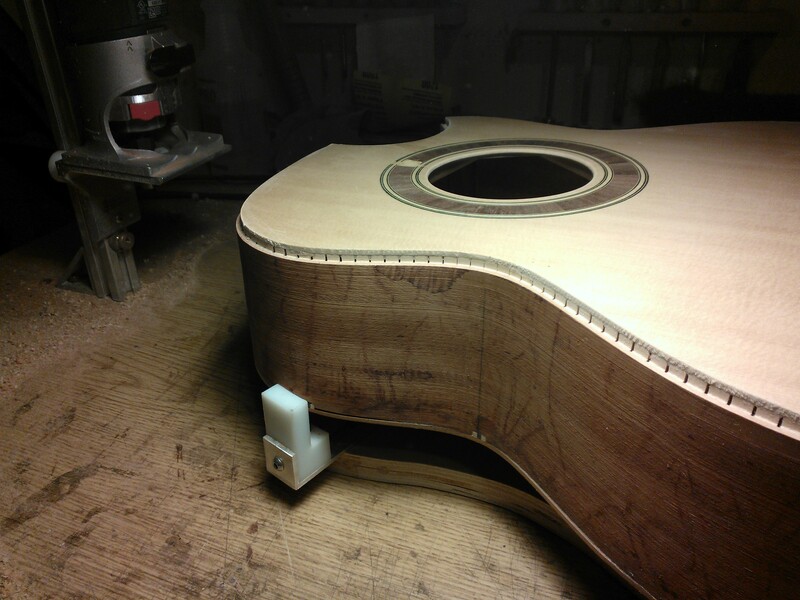 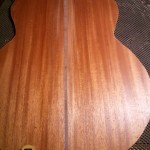 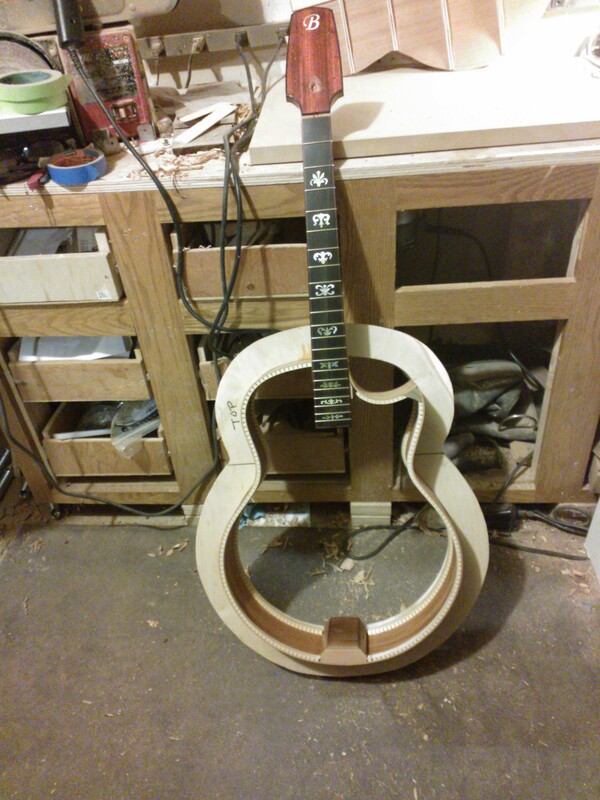 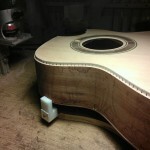 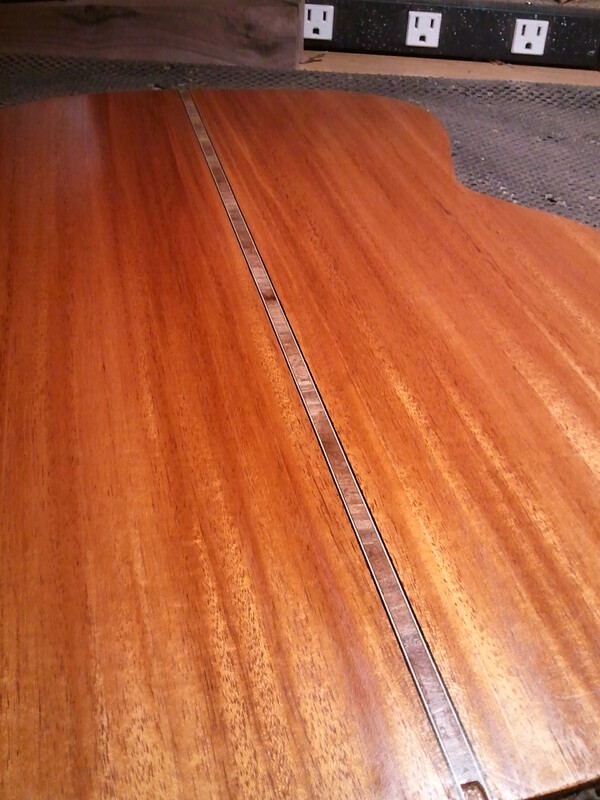 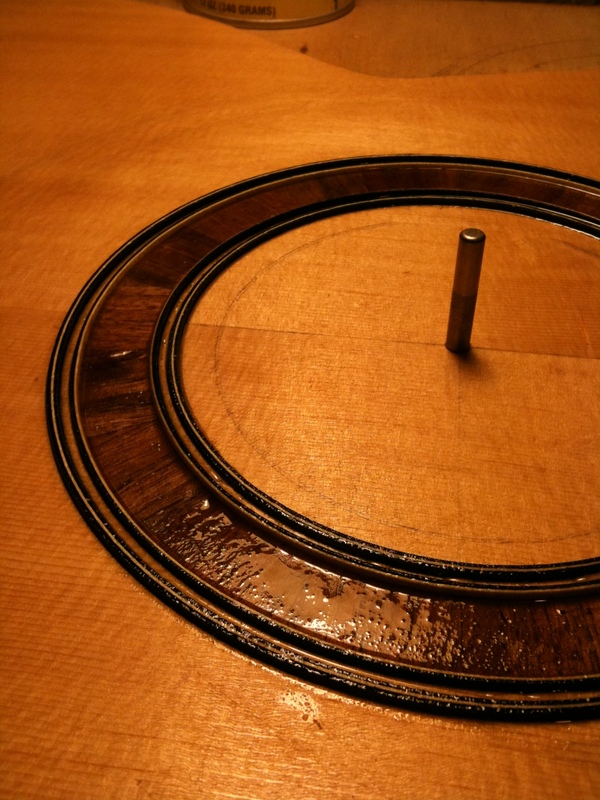 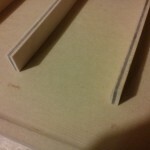 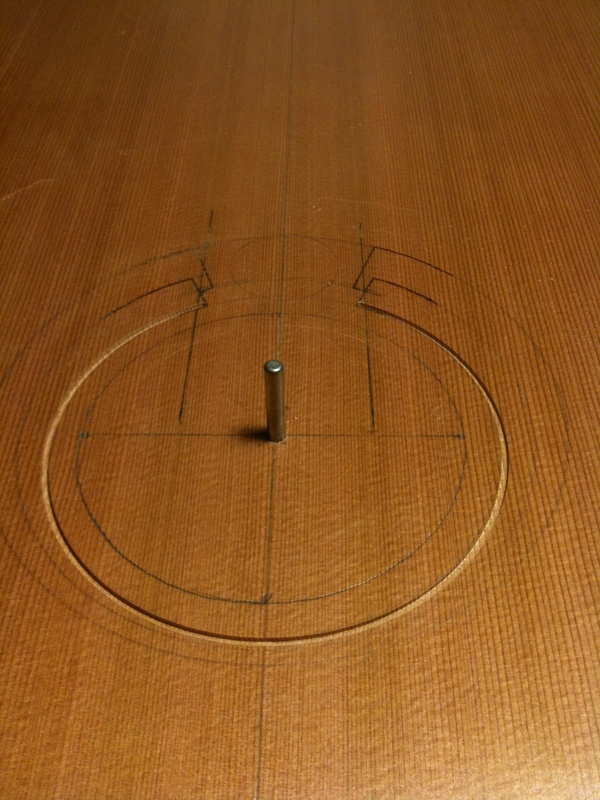 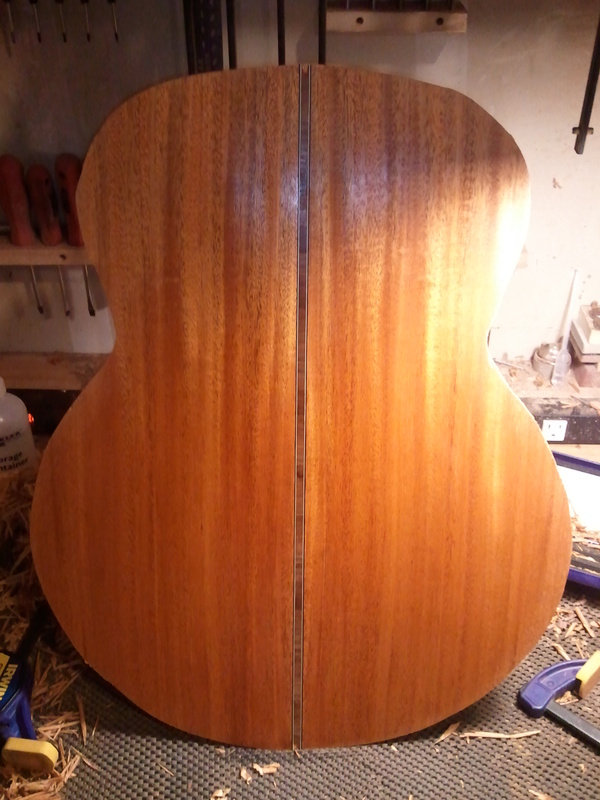 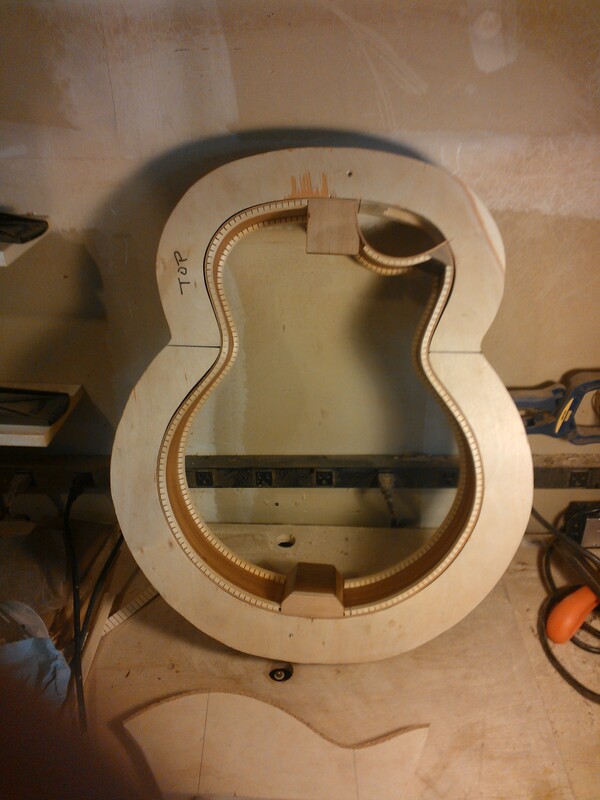 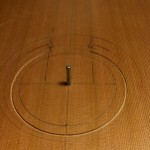 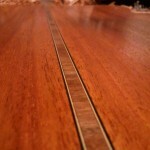 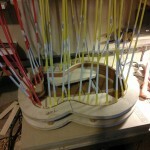 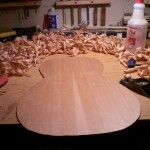 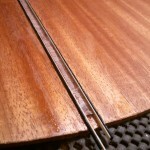 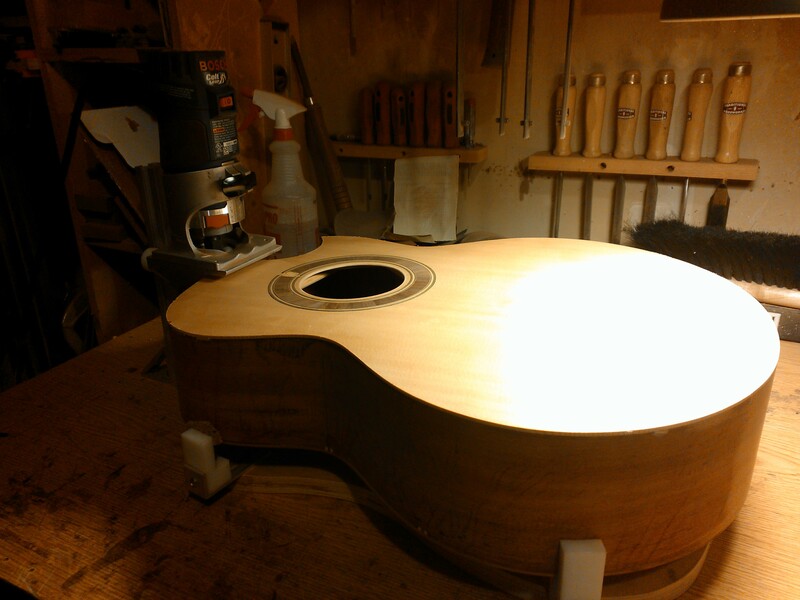 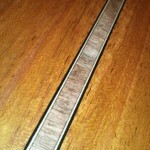 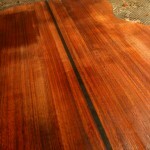 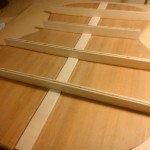 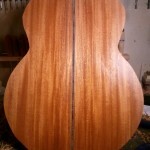 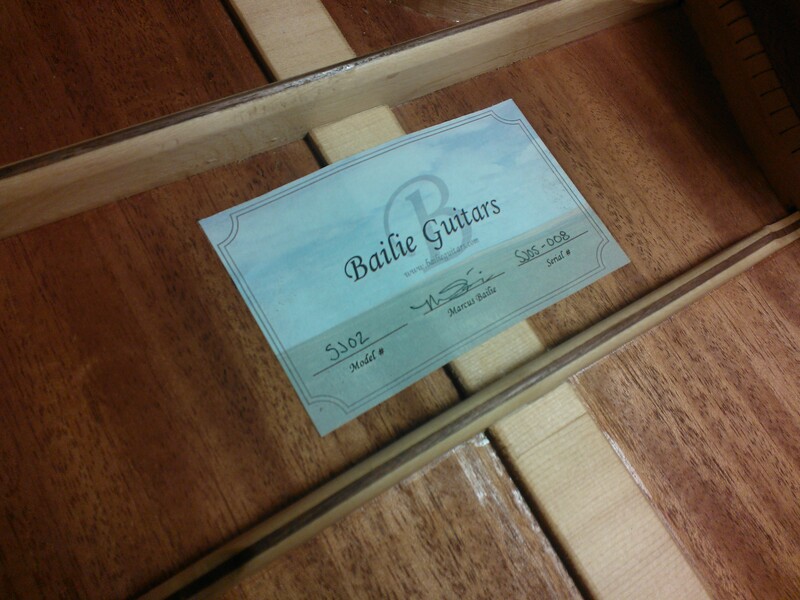 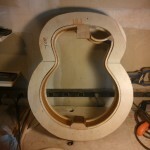 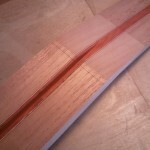 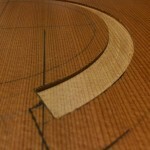 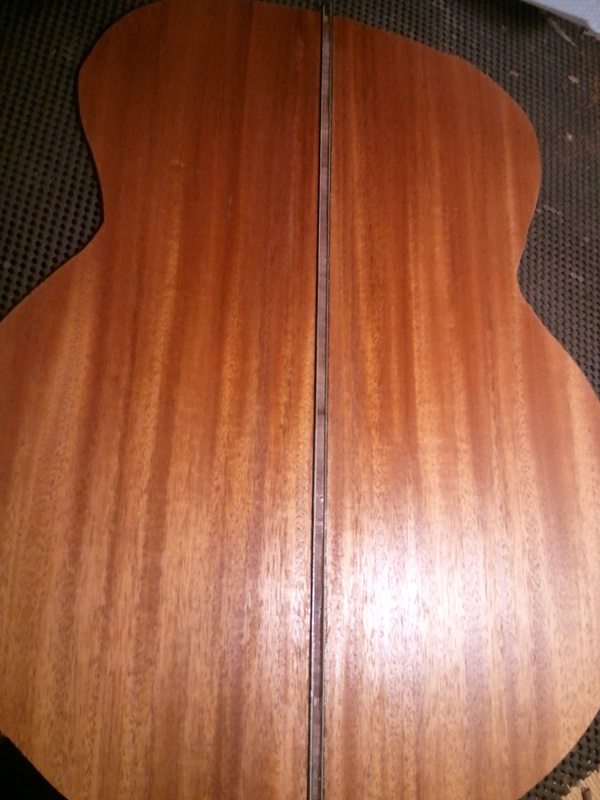 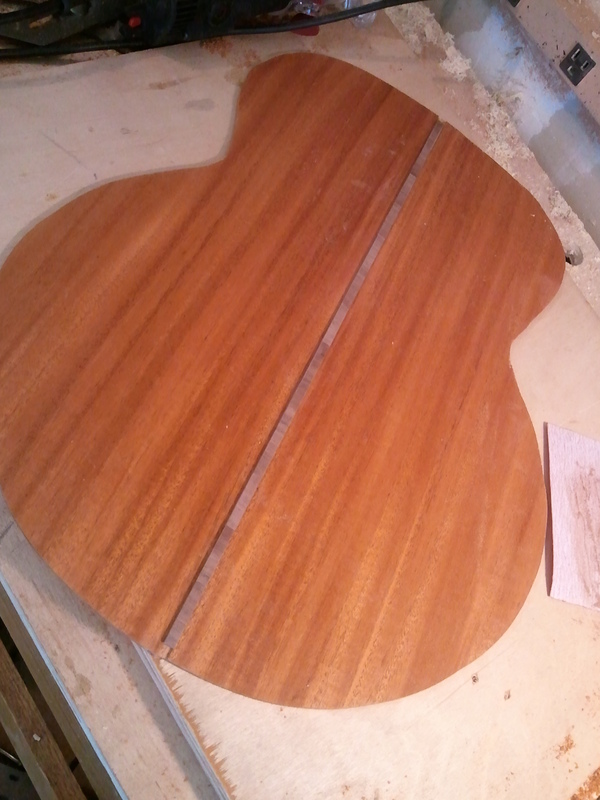 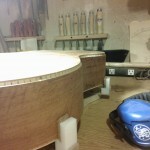 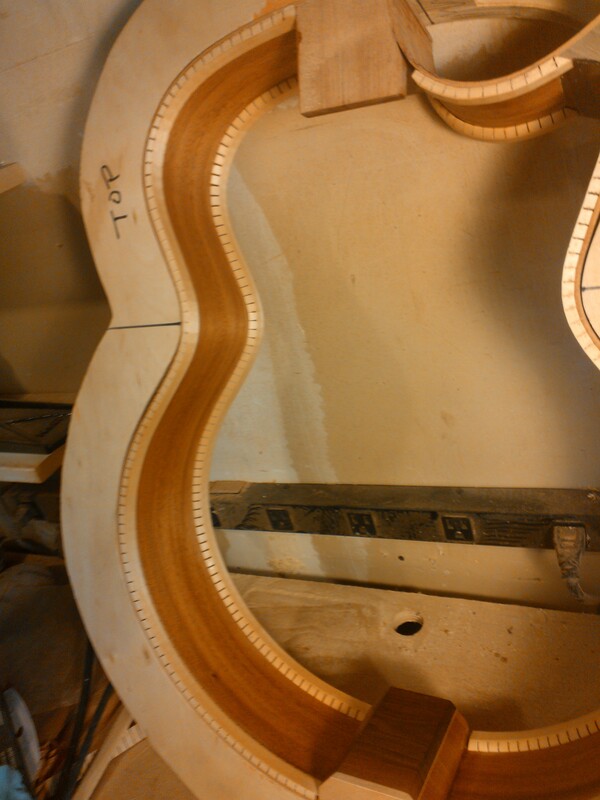 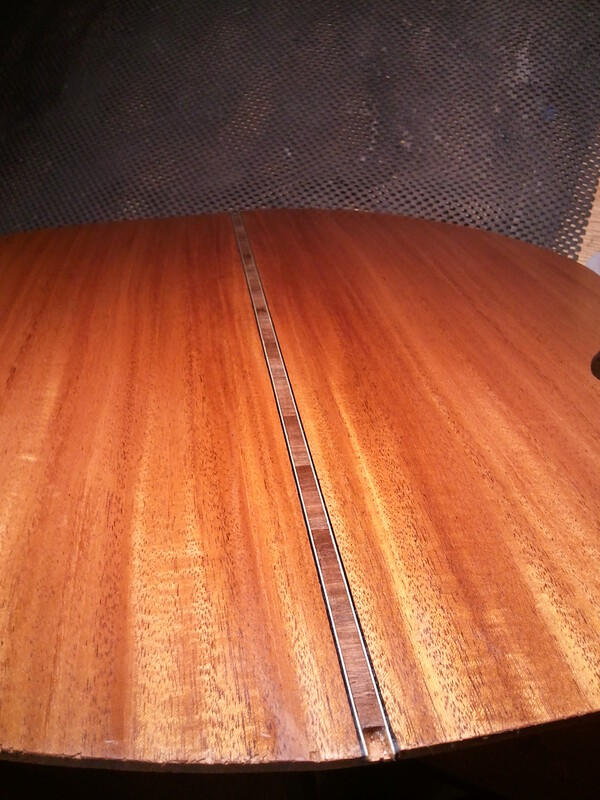 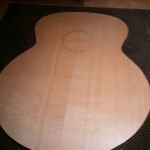 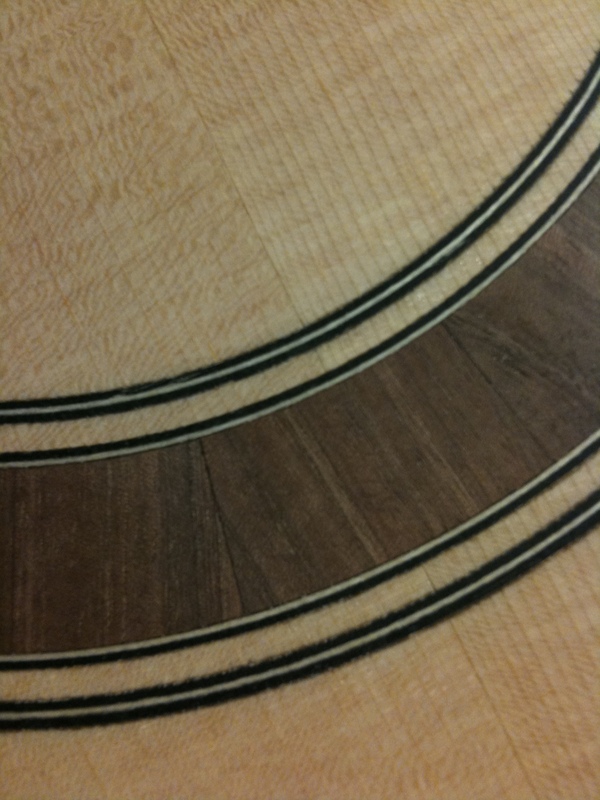 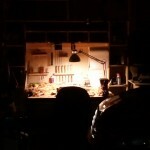 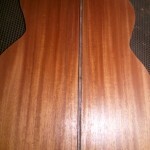 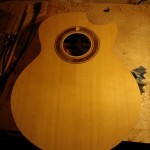 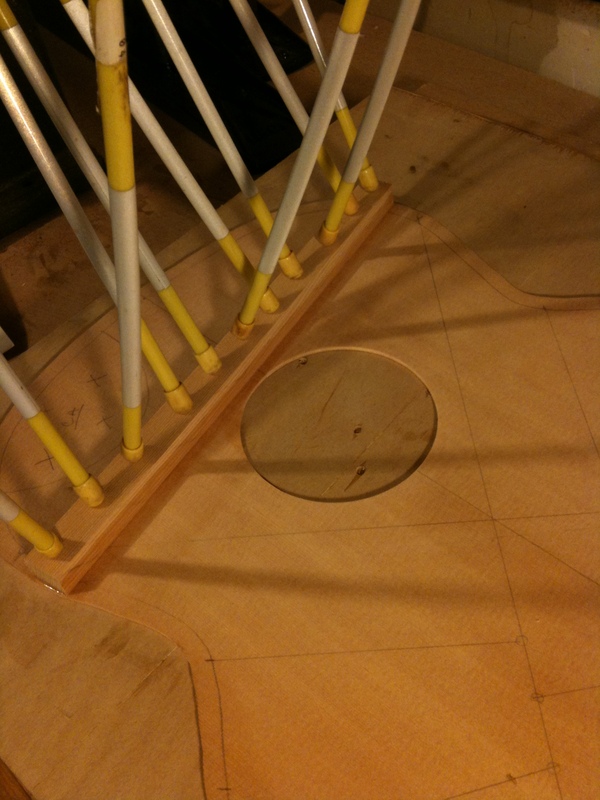 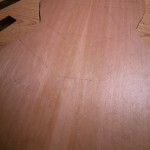 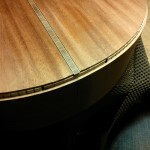 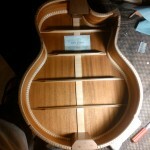 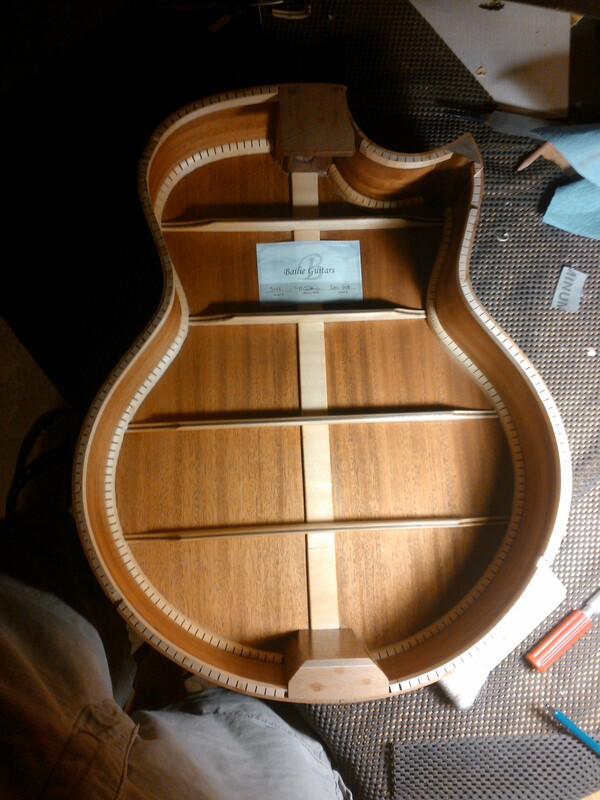 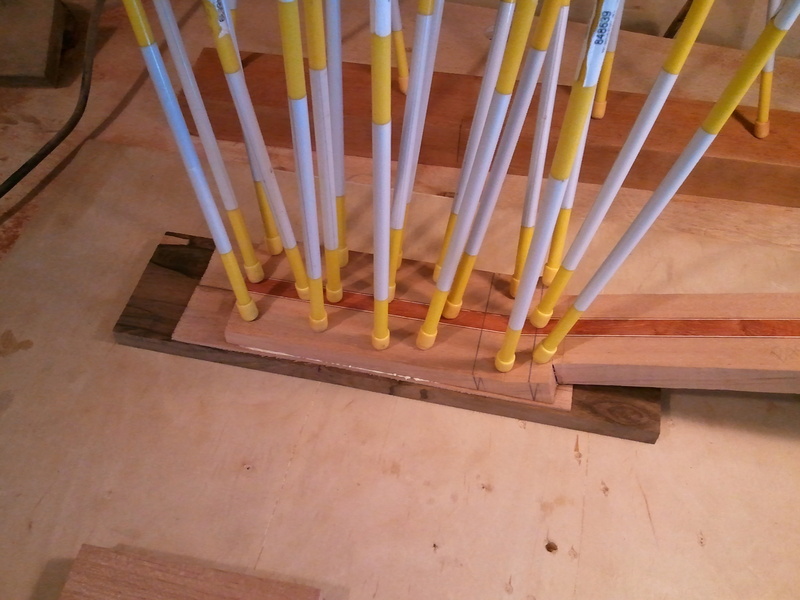 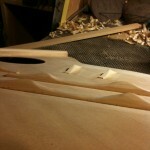 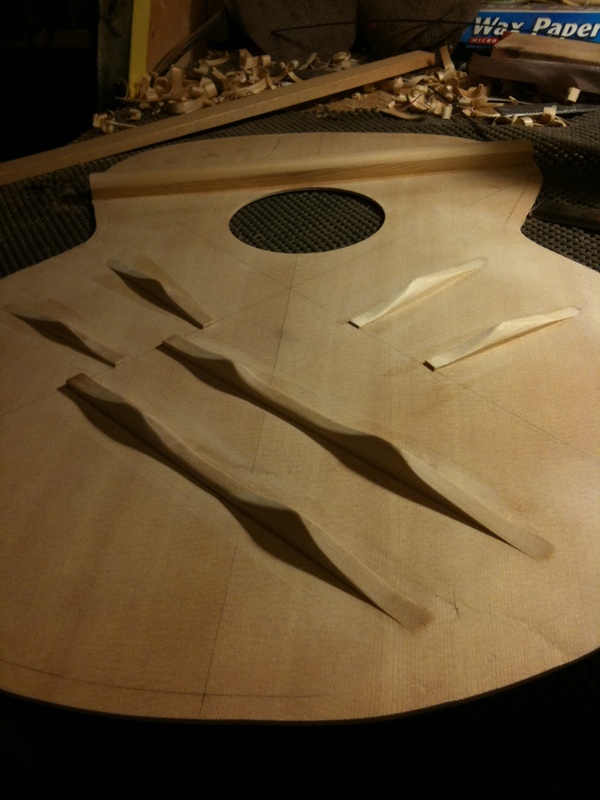 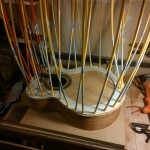 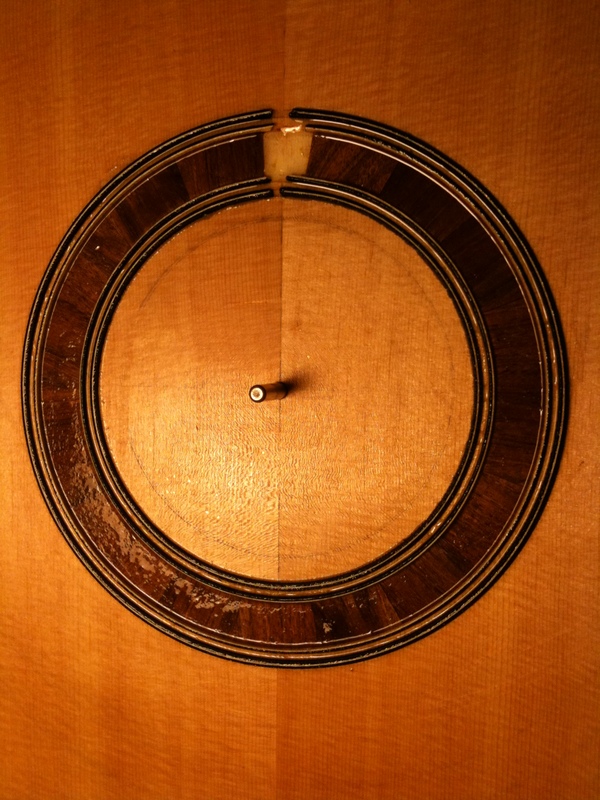 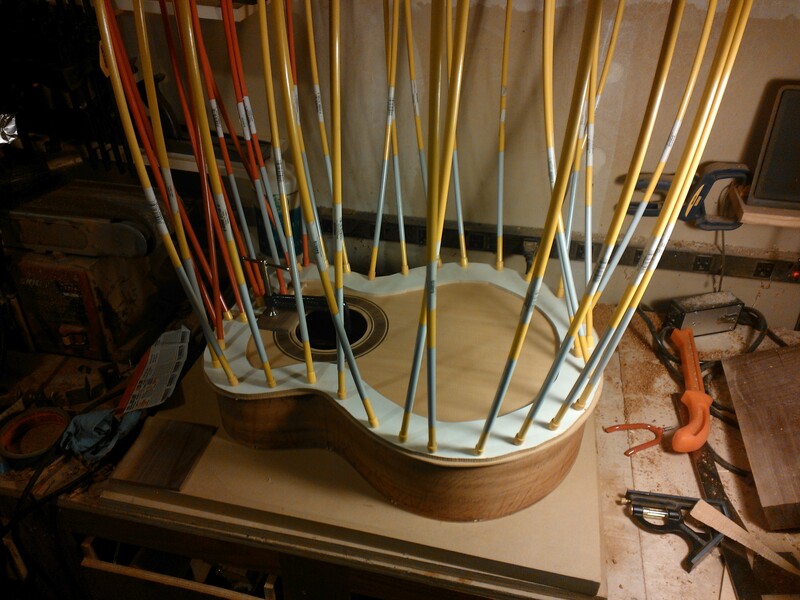 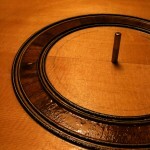 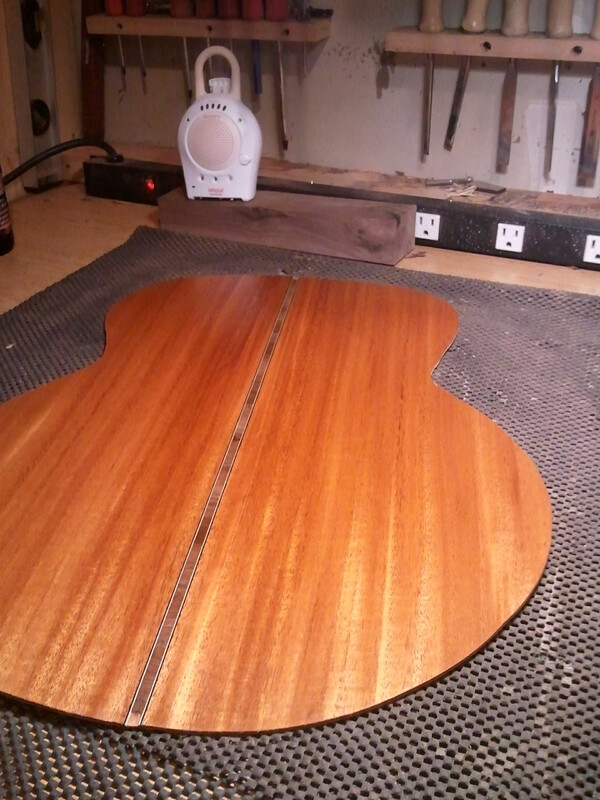 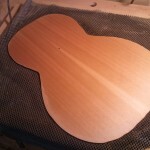 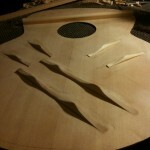 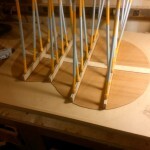 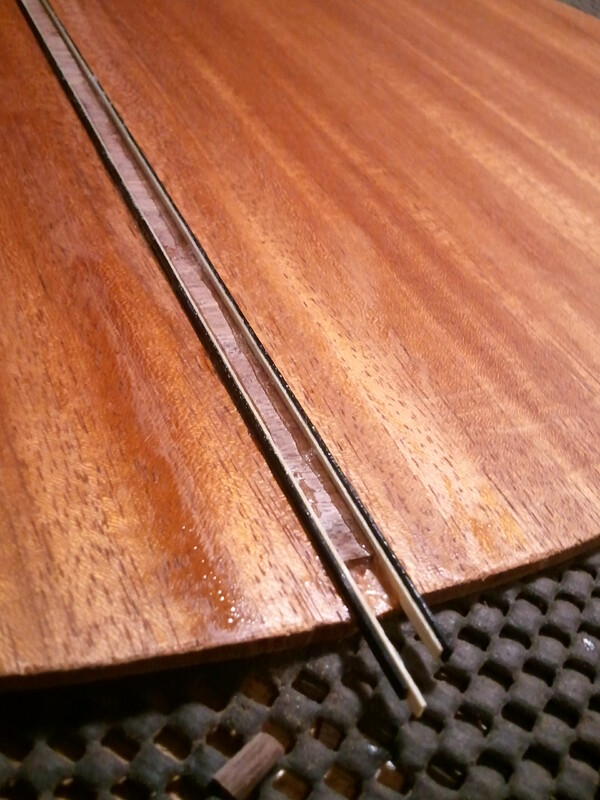 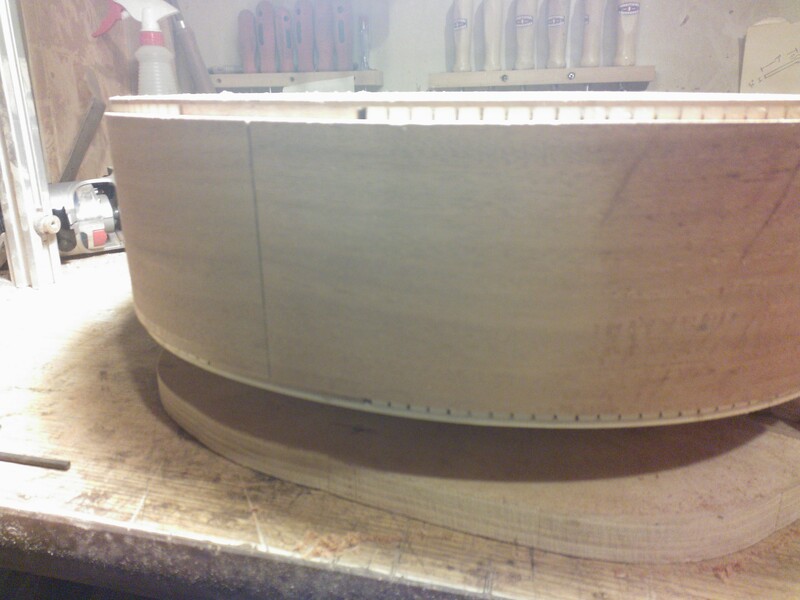 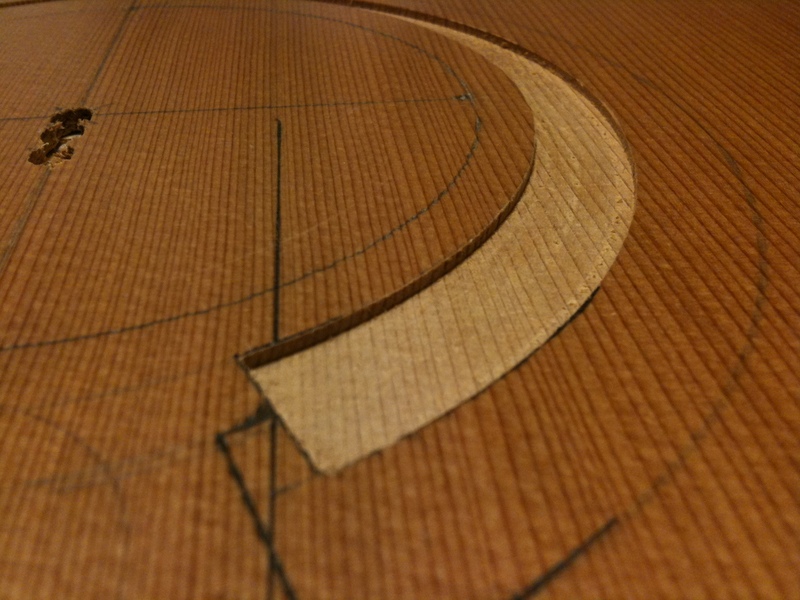 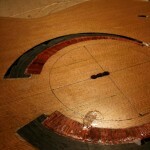 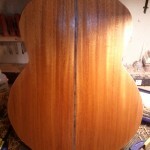 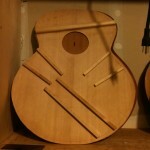 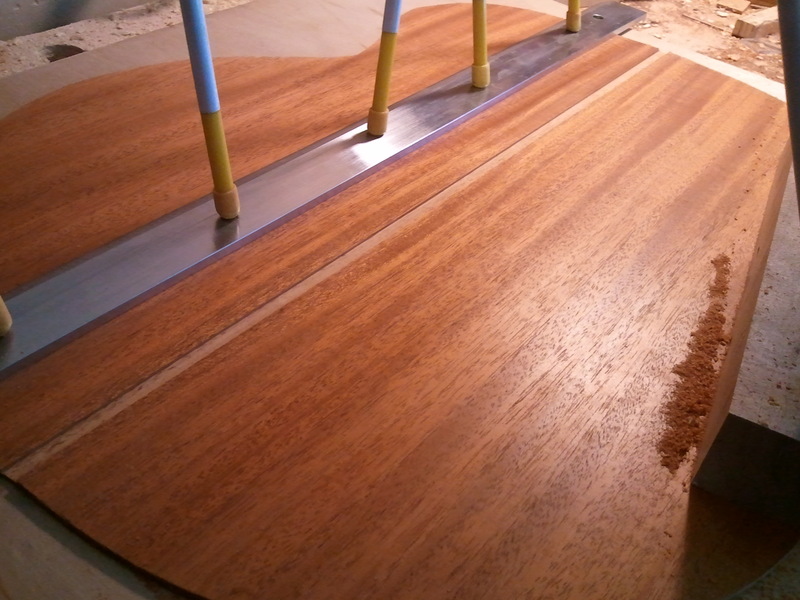 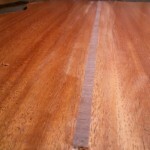 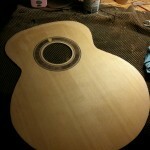 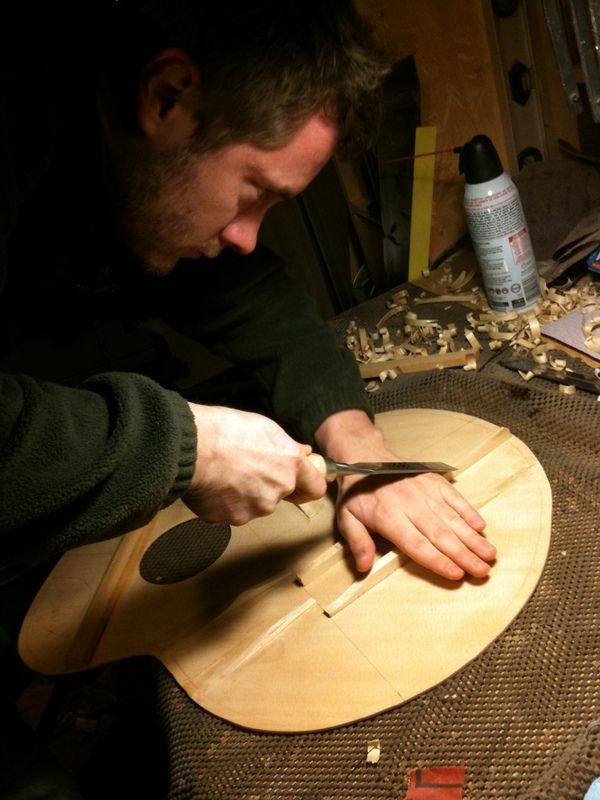 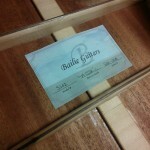 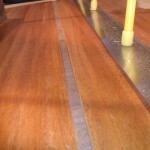 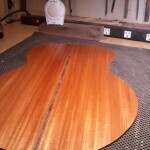 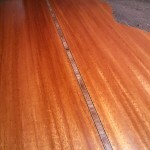 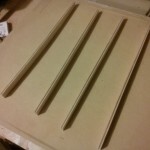 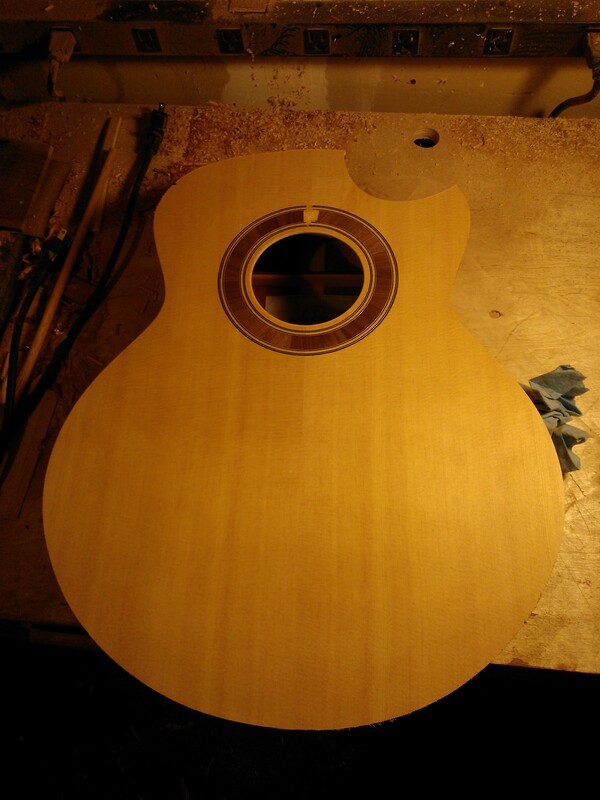 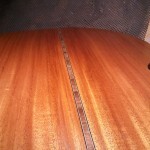 The majority of the work was developing the jigs for bending, gluing and shaping the cutaway parts of the guitar. 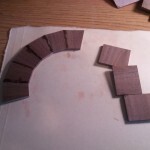 Now that those are done, I can move forward! 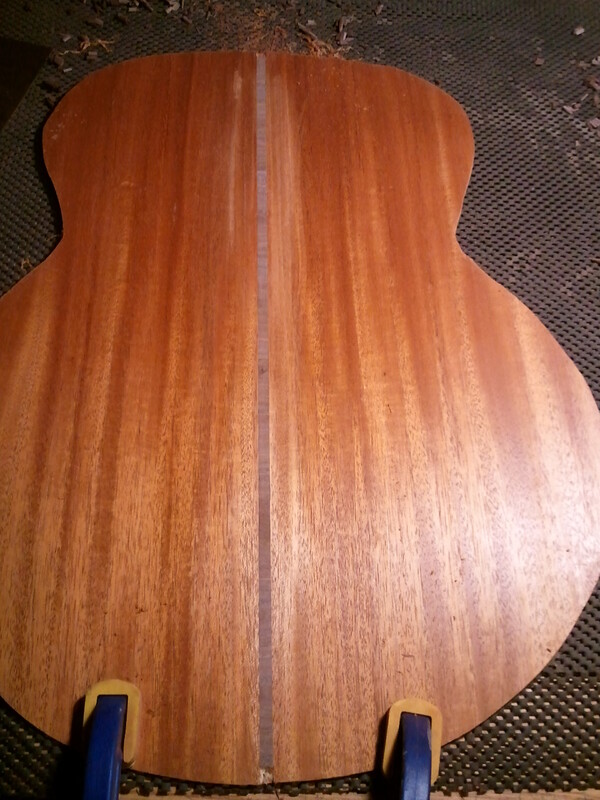 I’ll stop yakking and let you see the pictures. 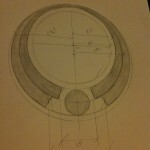 I haven’t gotten a whole lot done in the last few weeks. 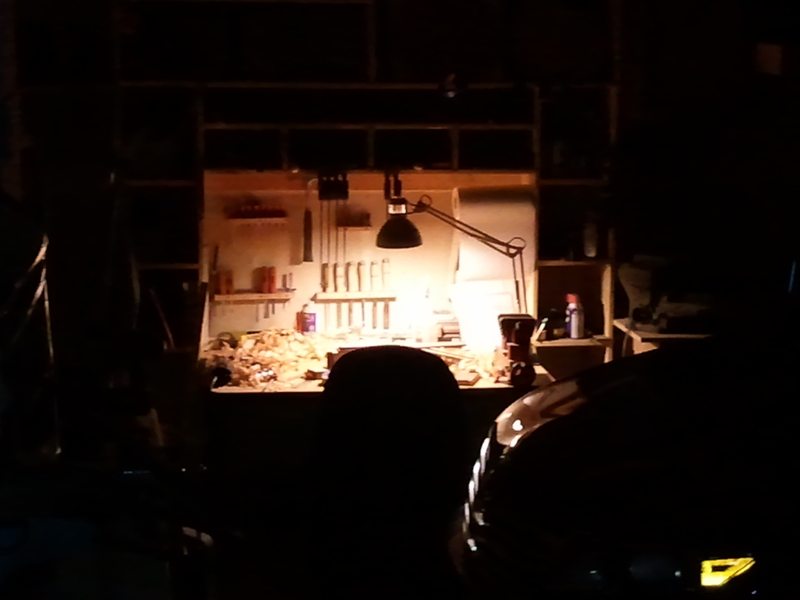 As it turns out, it’s difficult to use loud machinery when your daughter is sleeping on the other side of the wall. 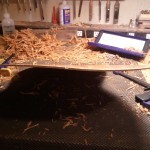 Here is what I was able to do in the precious few minutes I had. 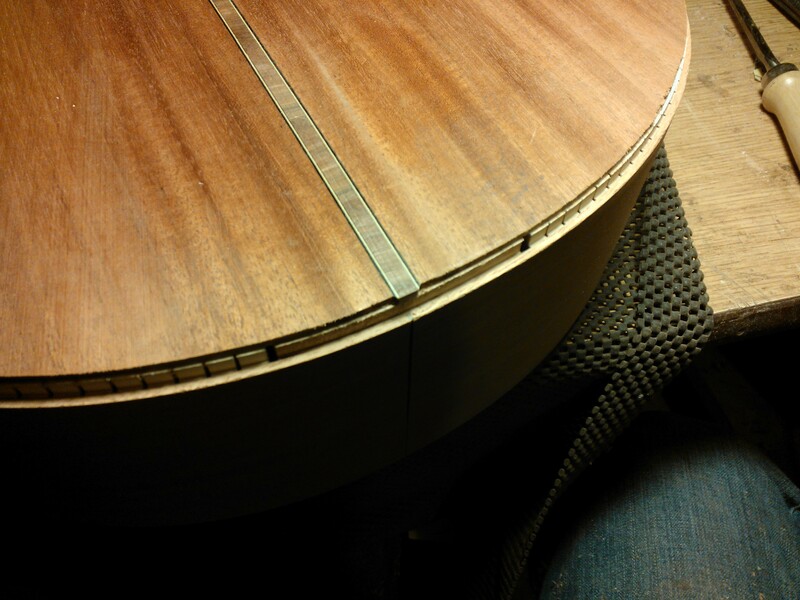 I got a small list of things knocked off the docket. 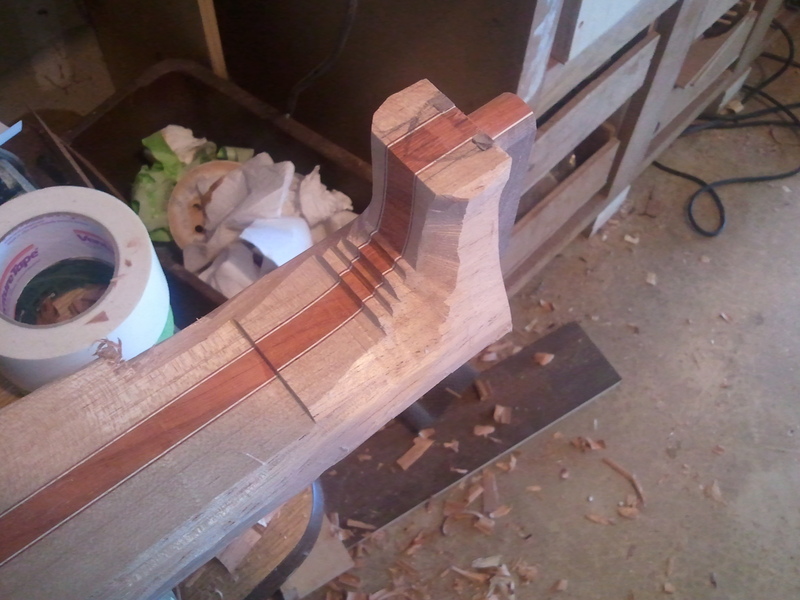 For #7, I got the neck in a good place to stay for when I get the body closed up. 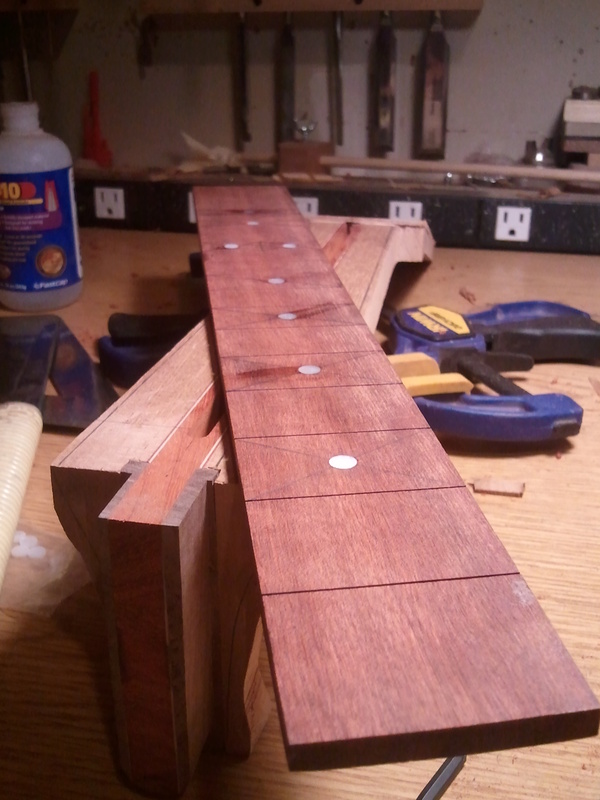 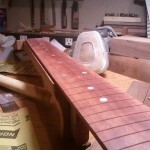 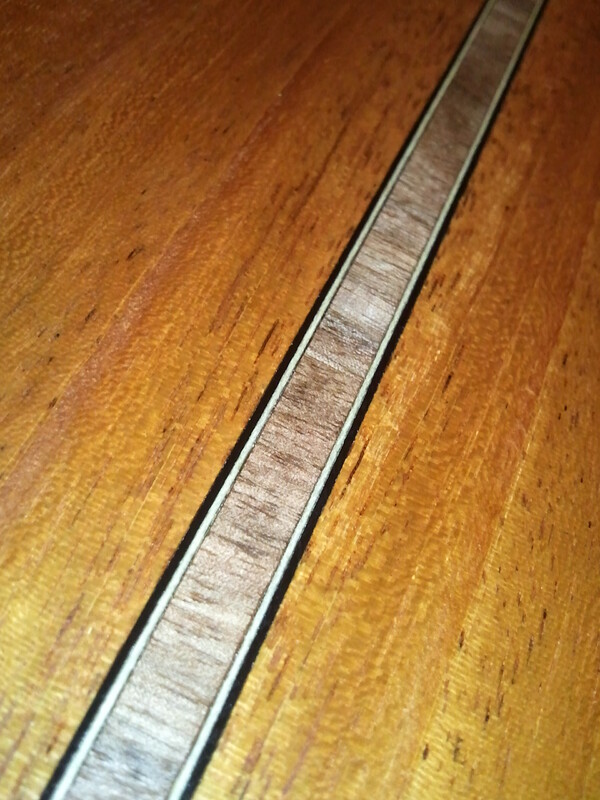 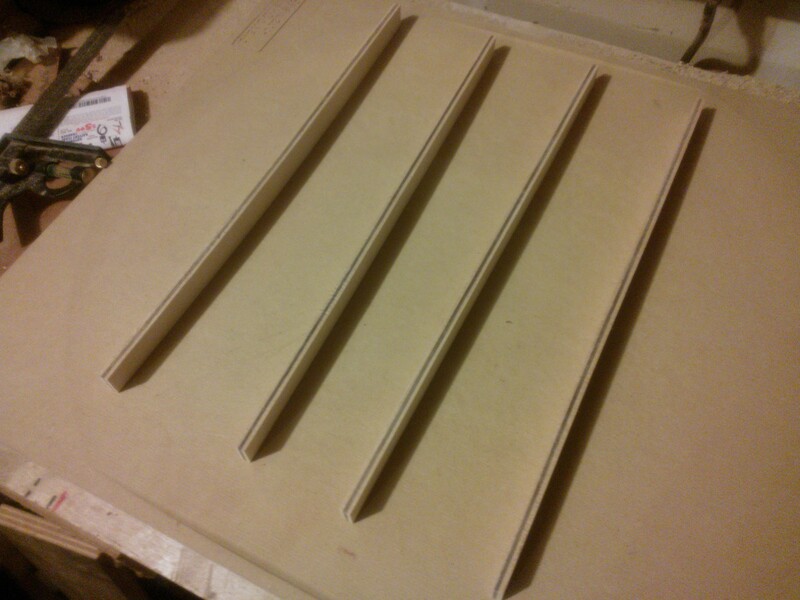 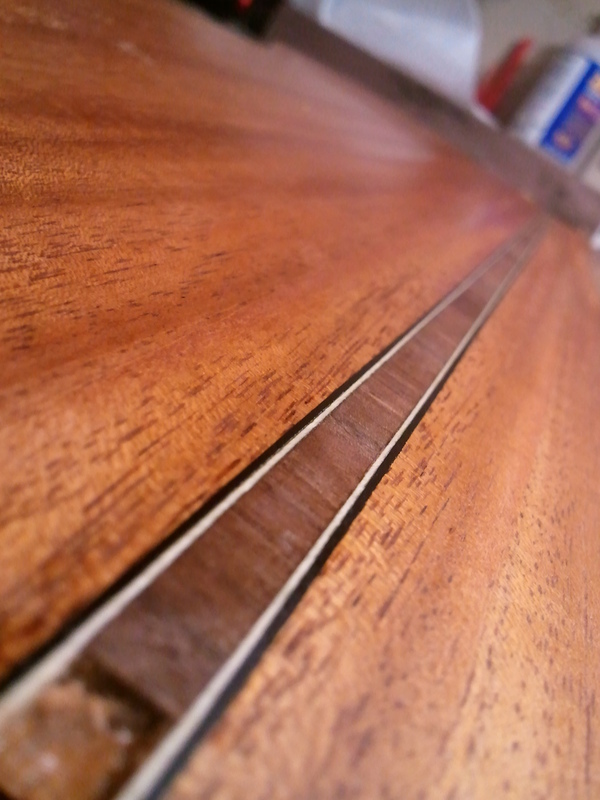 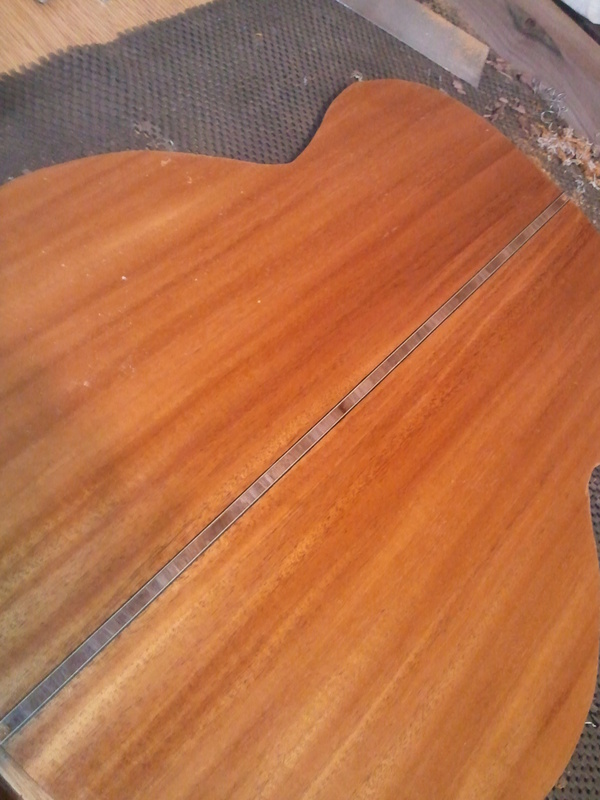 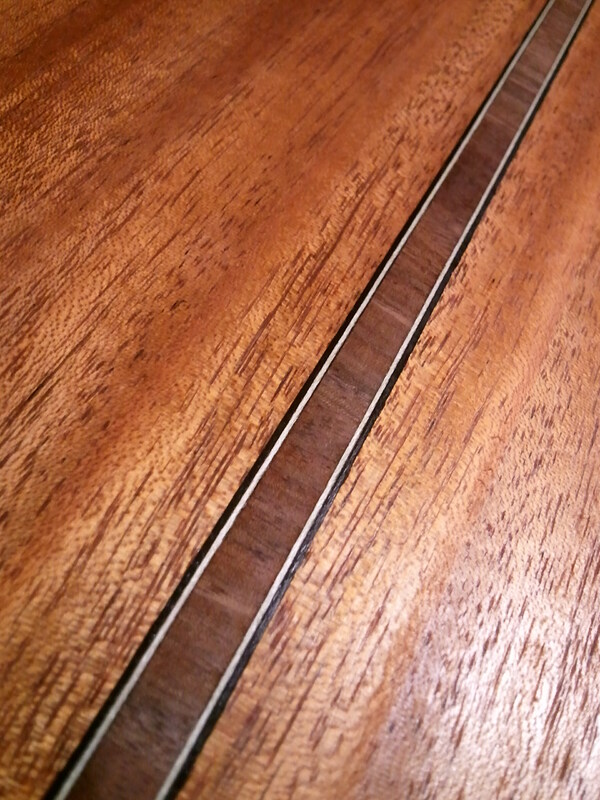 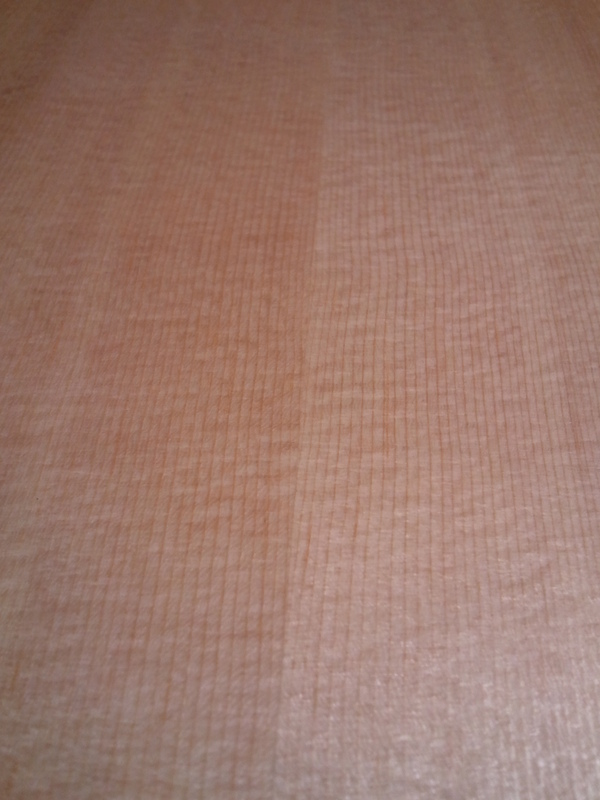 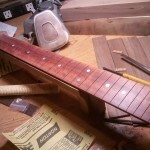 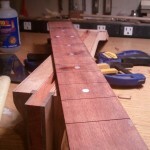 The fretboard is basically done, but I planed it down a little to thin, so I might have to get another one. 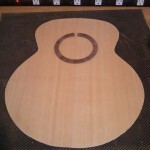 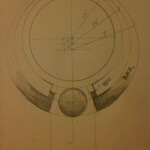 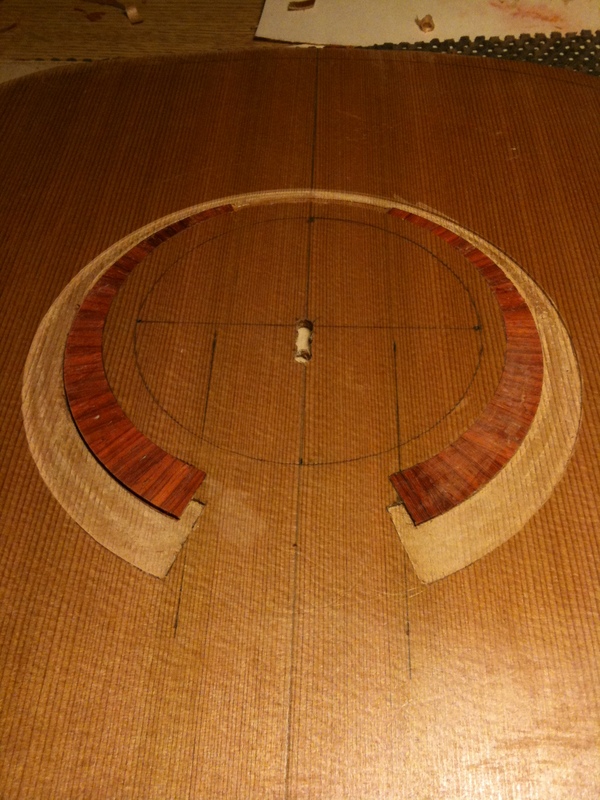 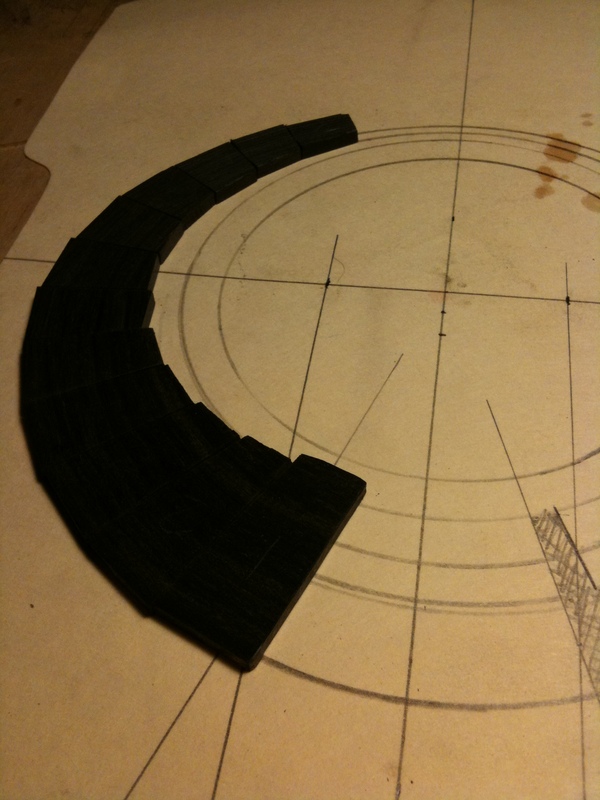 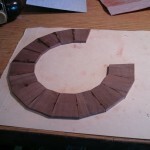 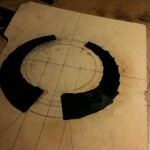 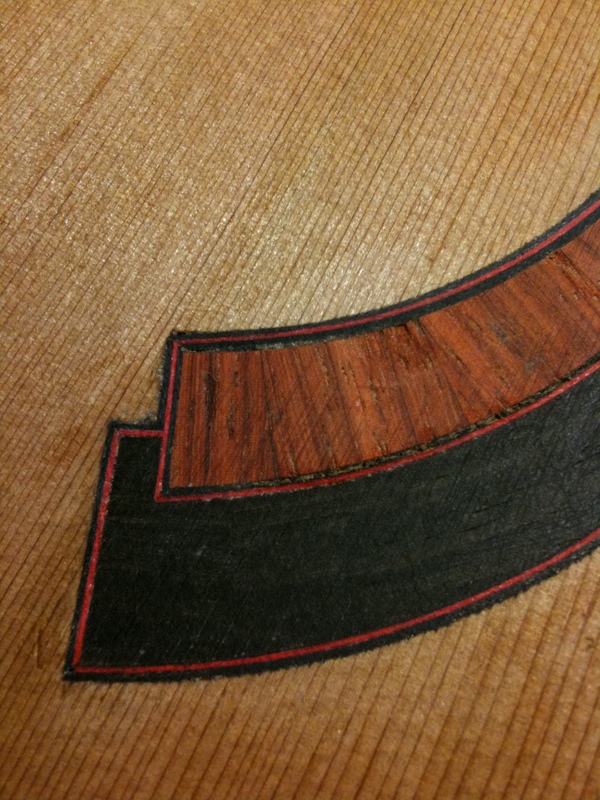 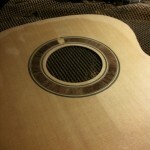 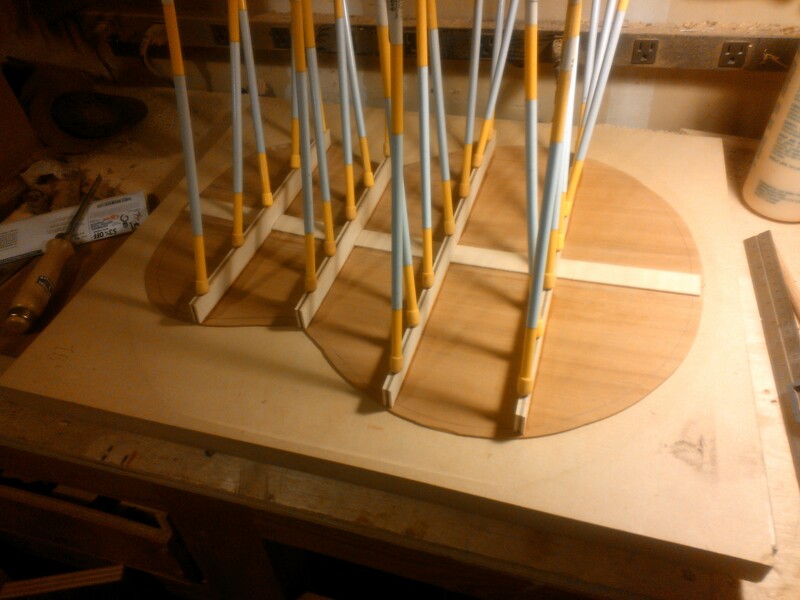 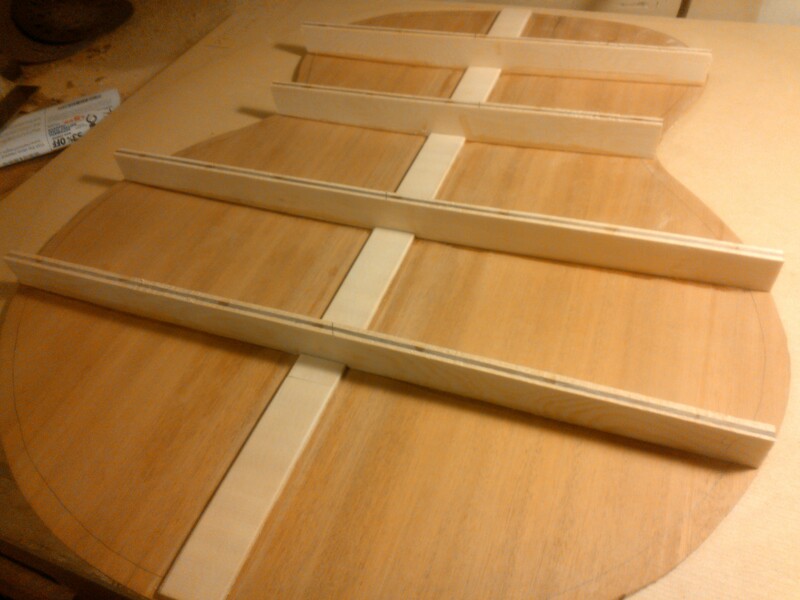 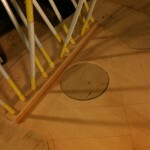 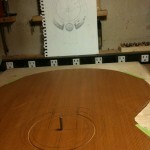 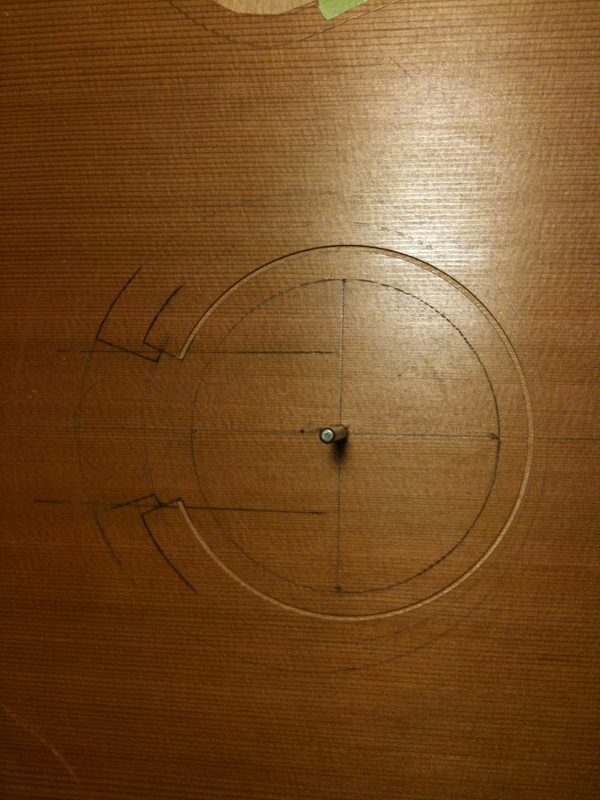 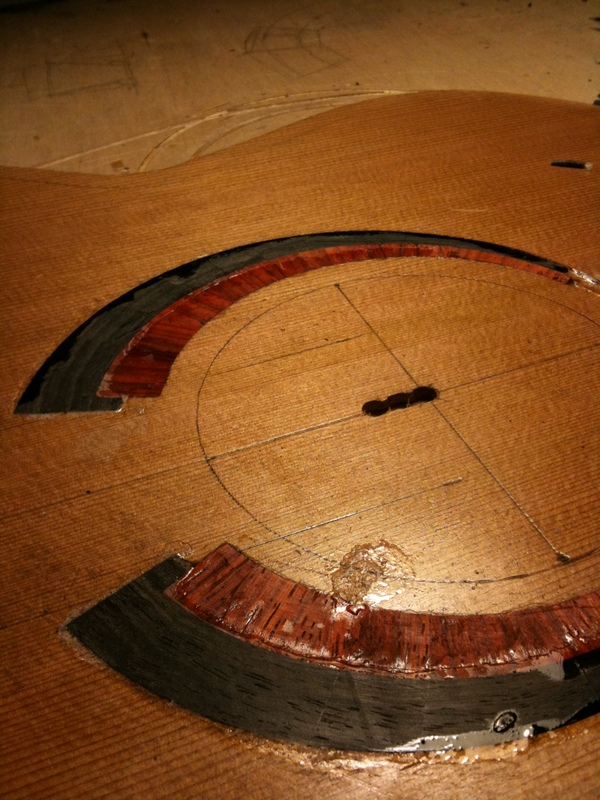 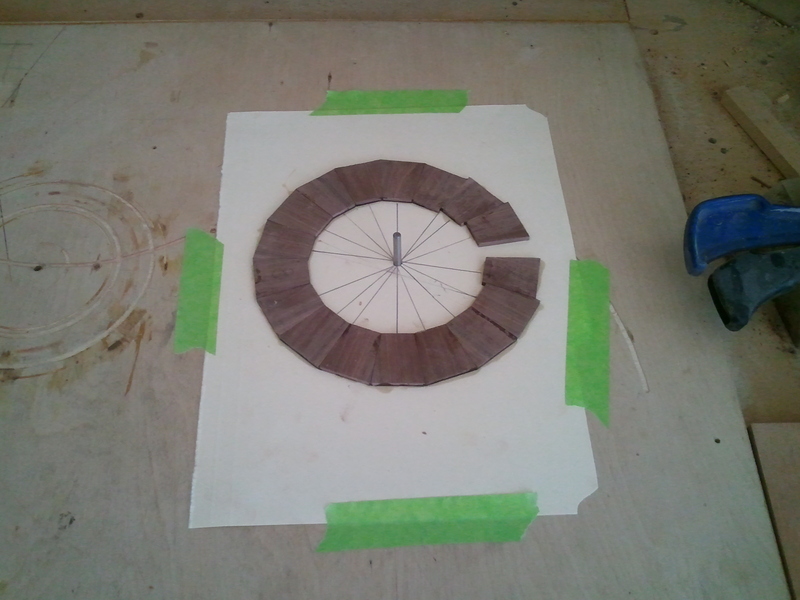 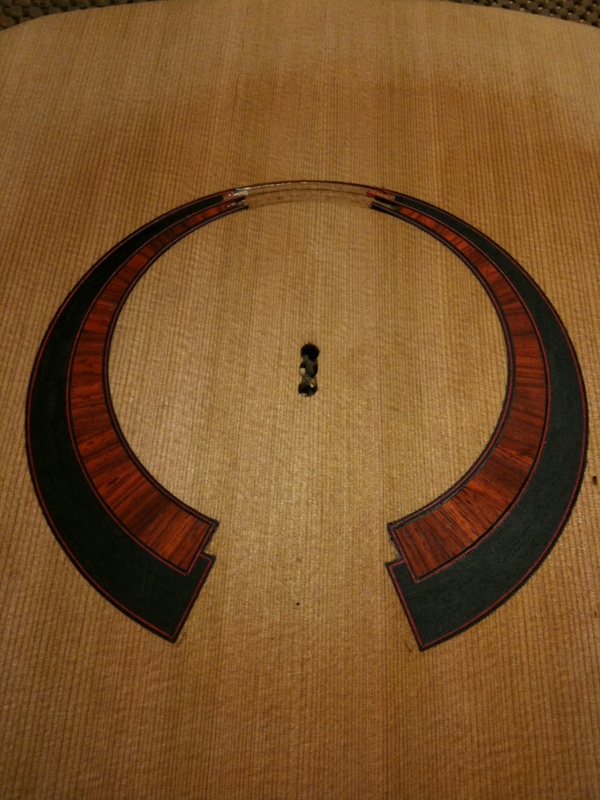 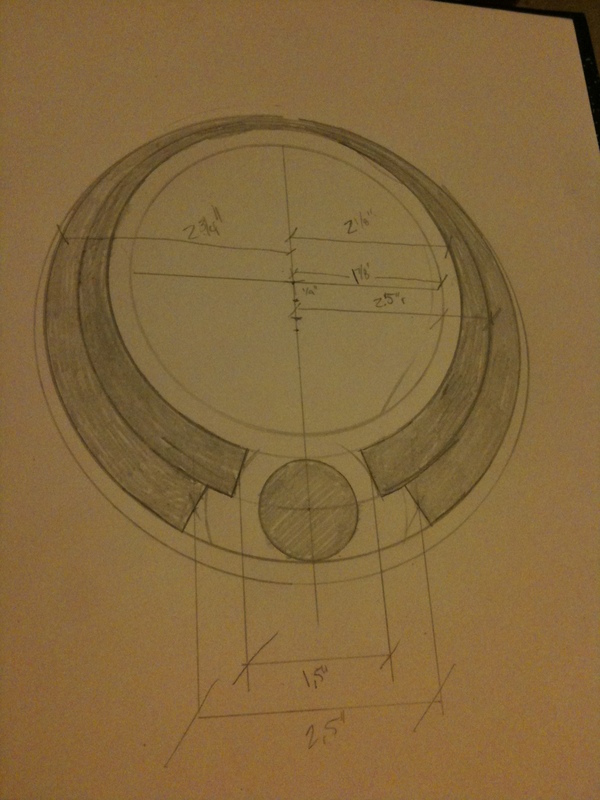 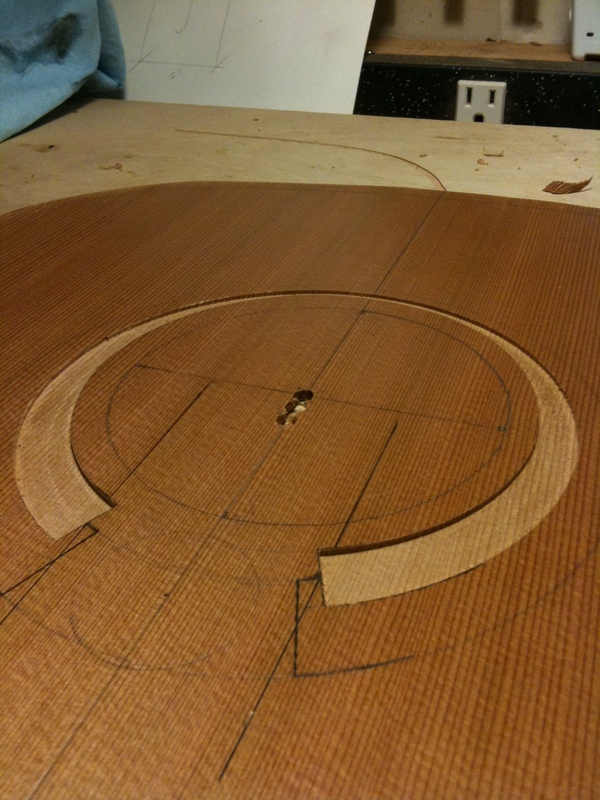 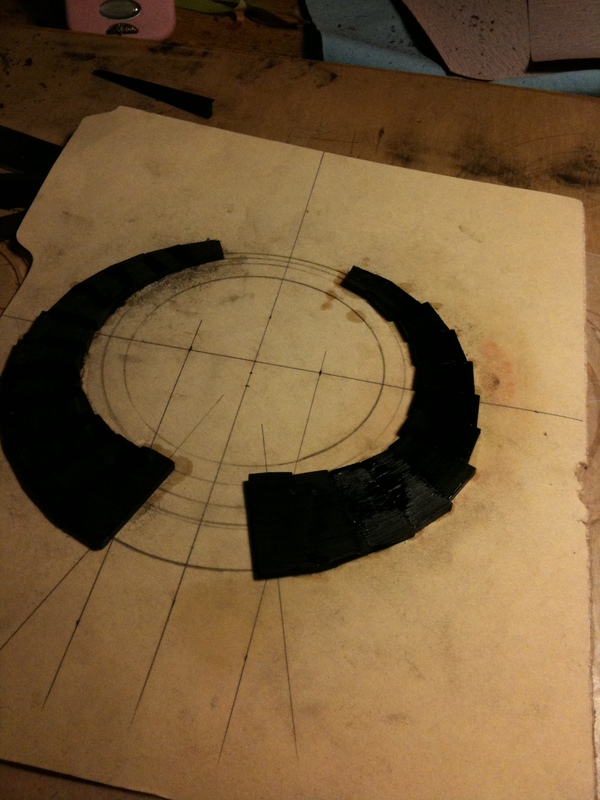 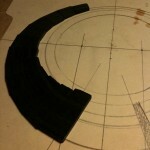 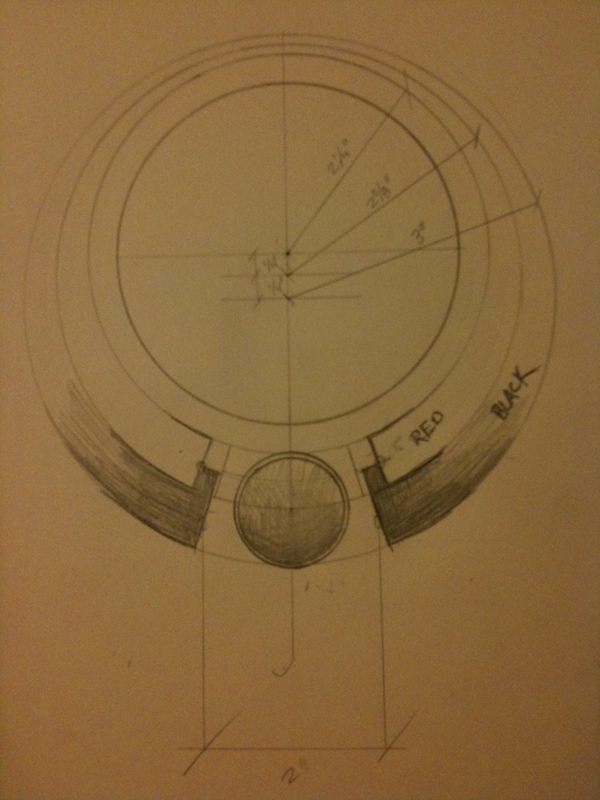 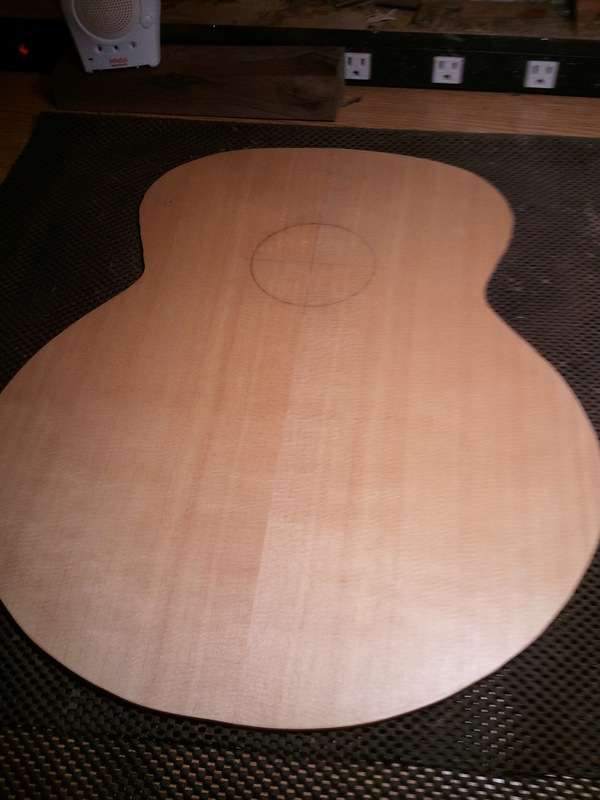 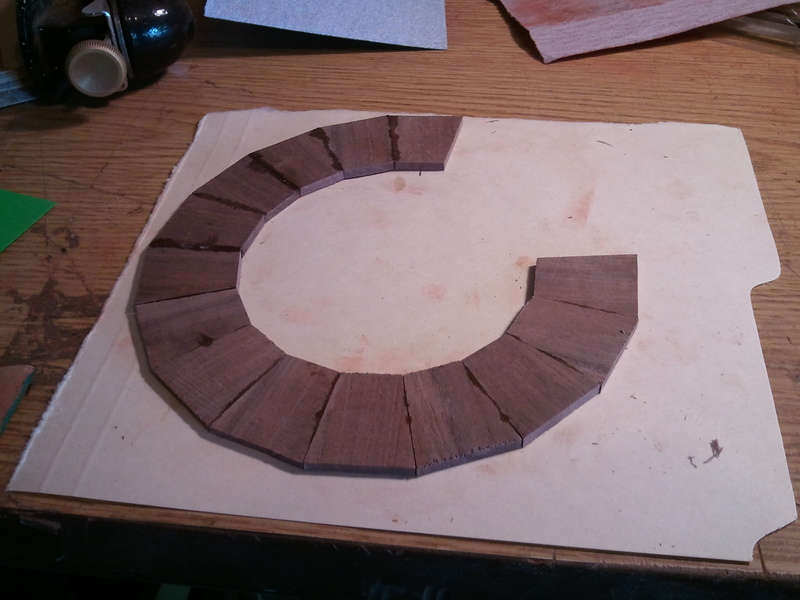 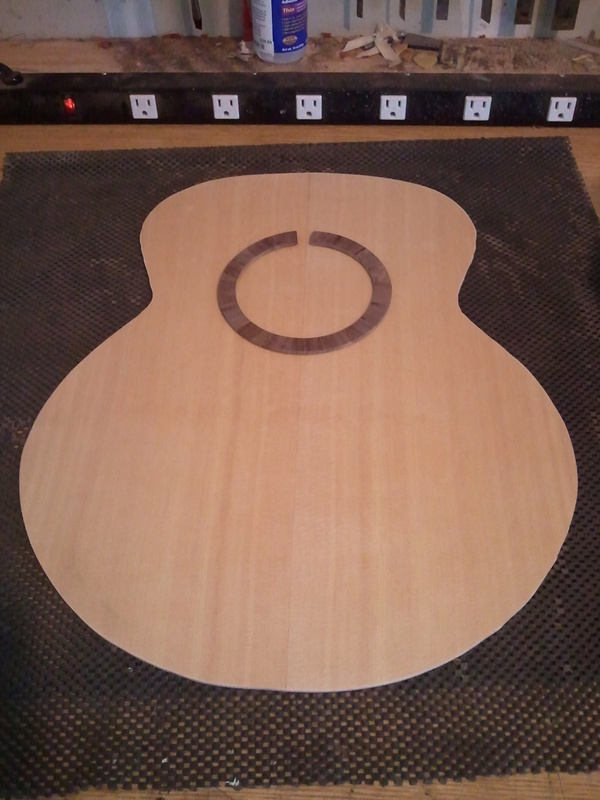 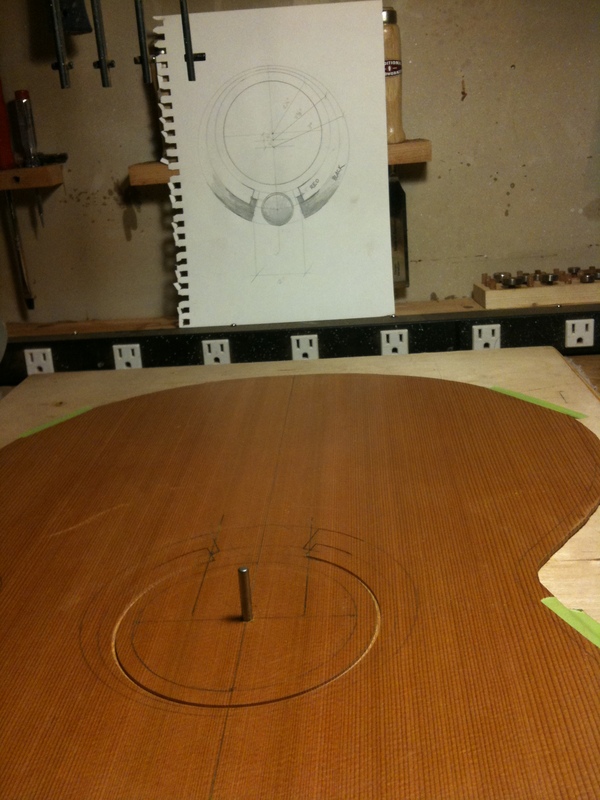 The rosette has been designed (I’ll leave that as a teaser), and the soundboard has been sanded and thicknessed. 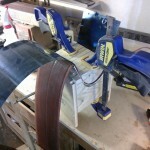 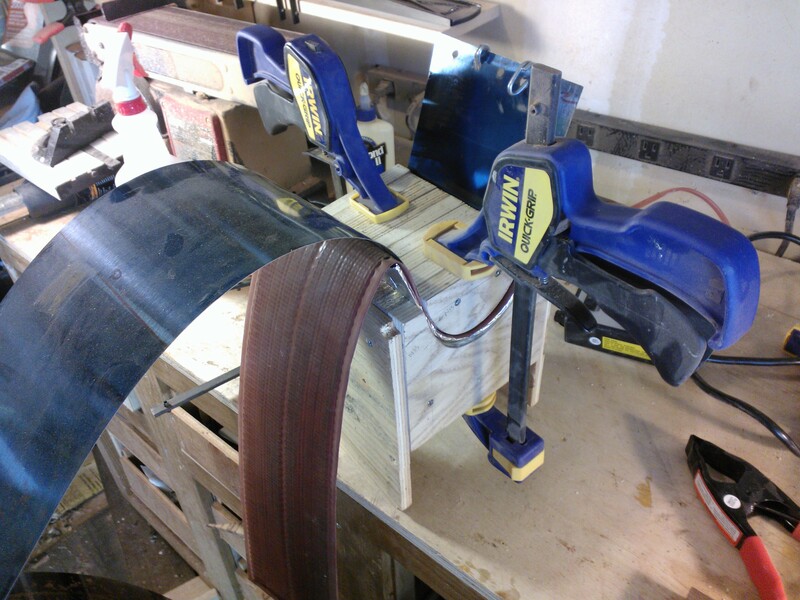 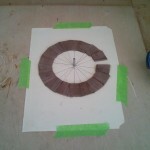 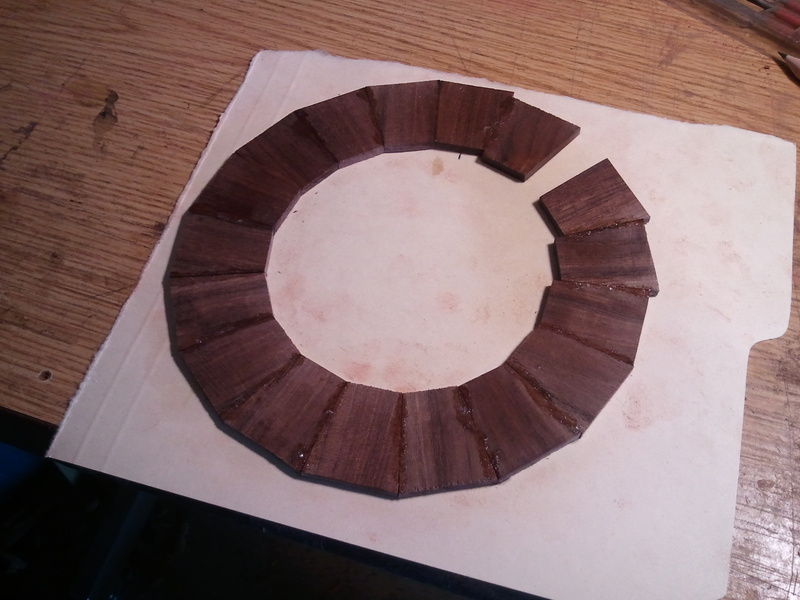 I think I am going to wait until I get a drum sander before I start the rosette. 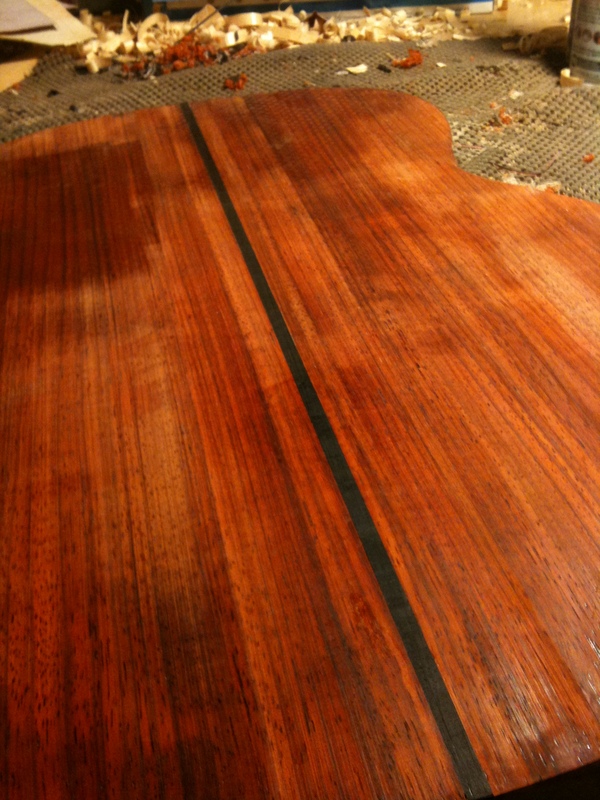 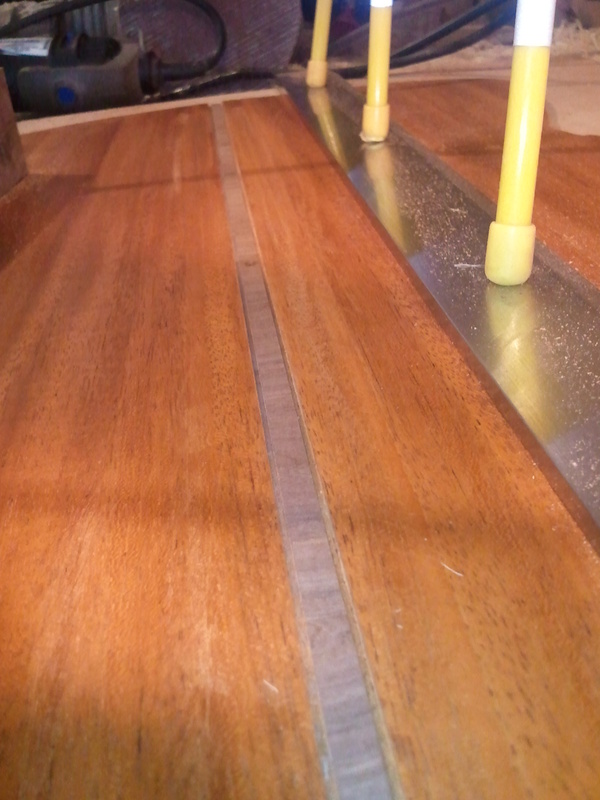 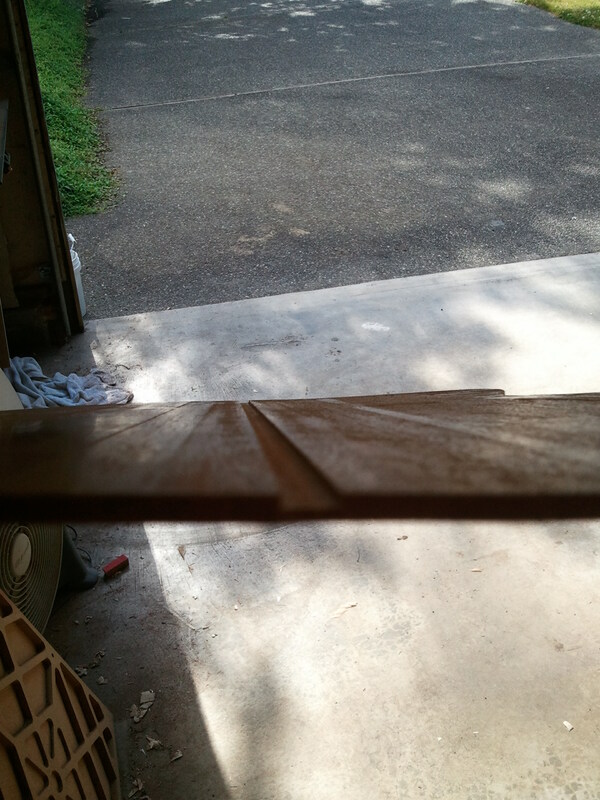 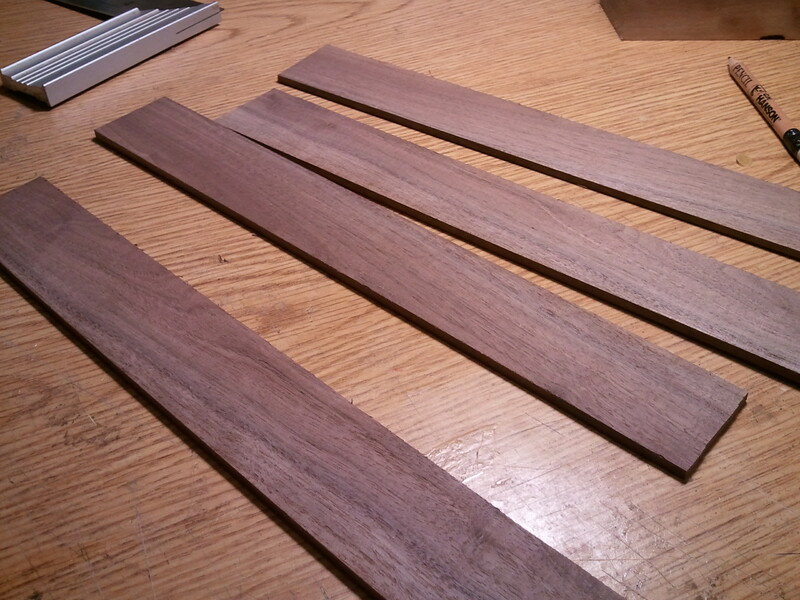 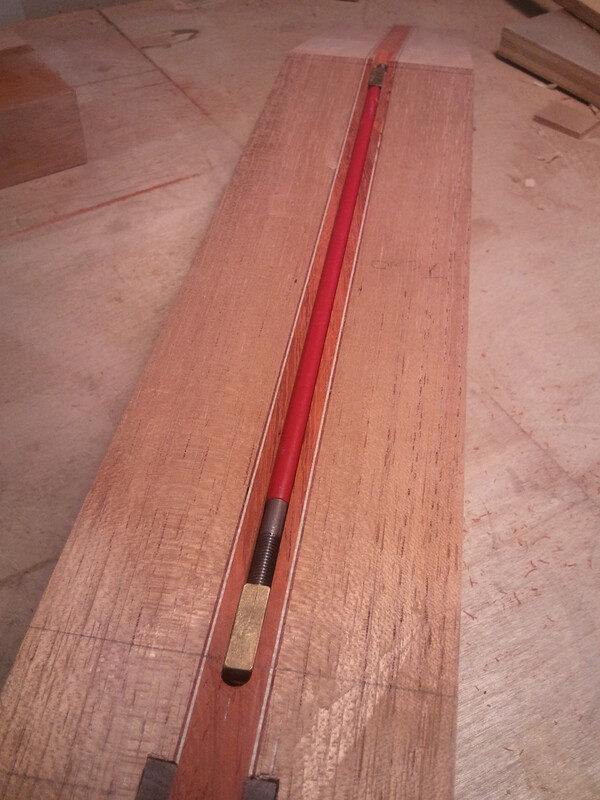 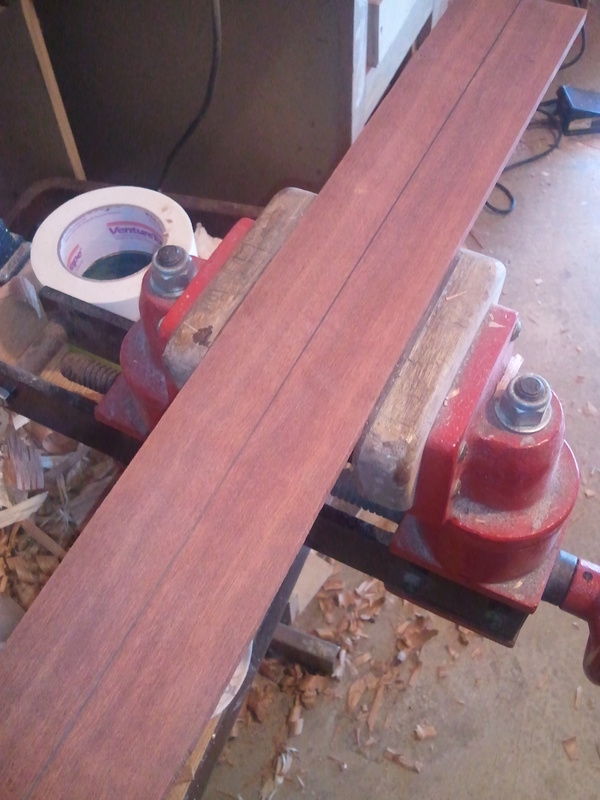 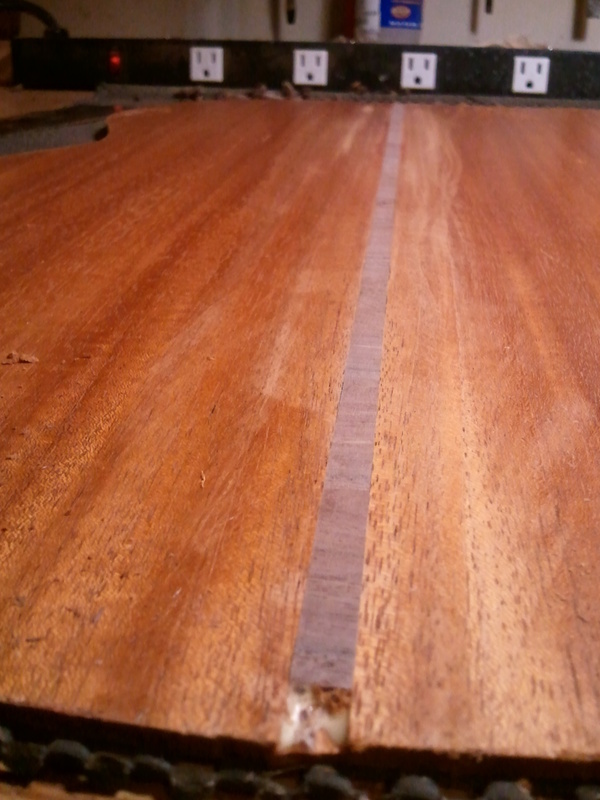 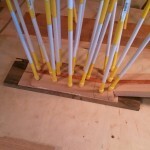 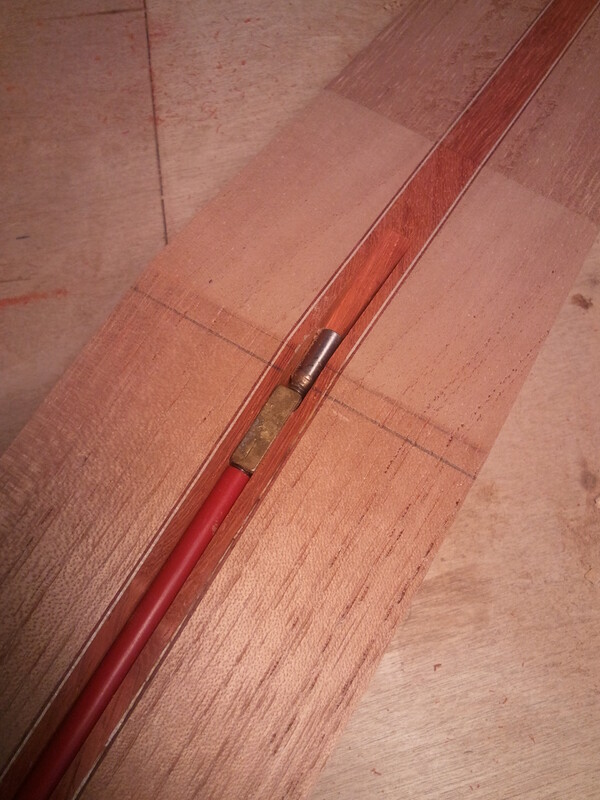 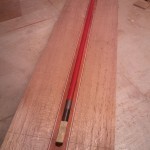 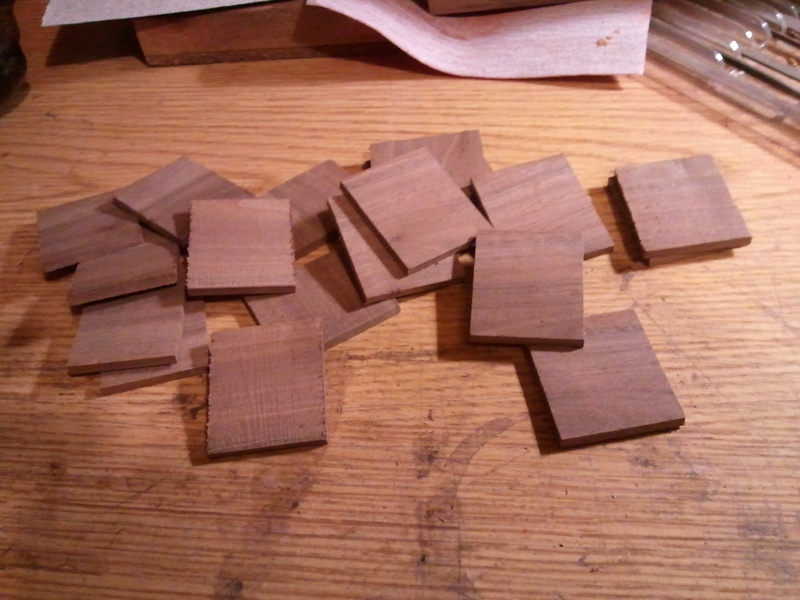 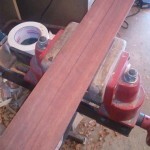 My previous interactions with bloodwood have lead me to believe that it’s significantly difficult to plane. 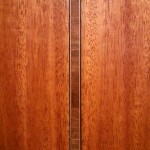 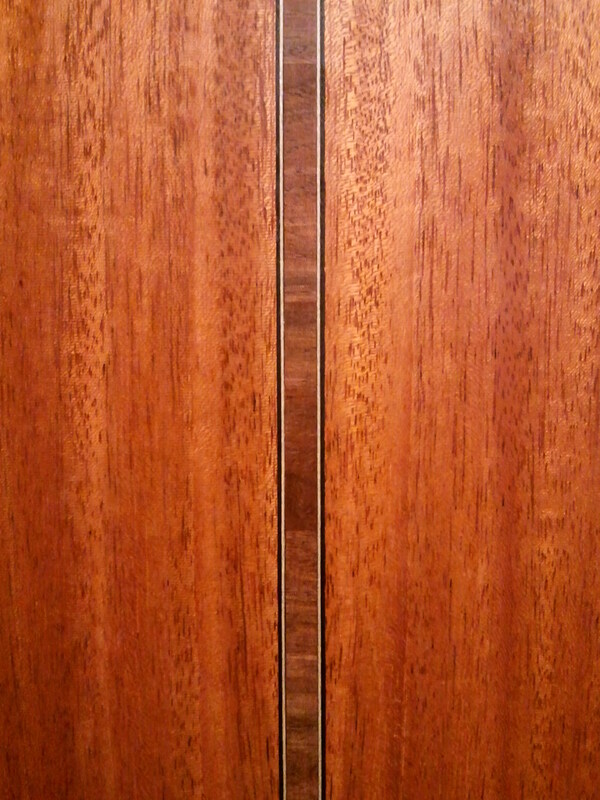 That, coupled with the soft cedar, could be very problematic. 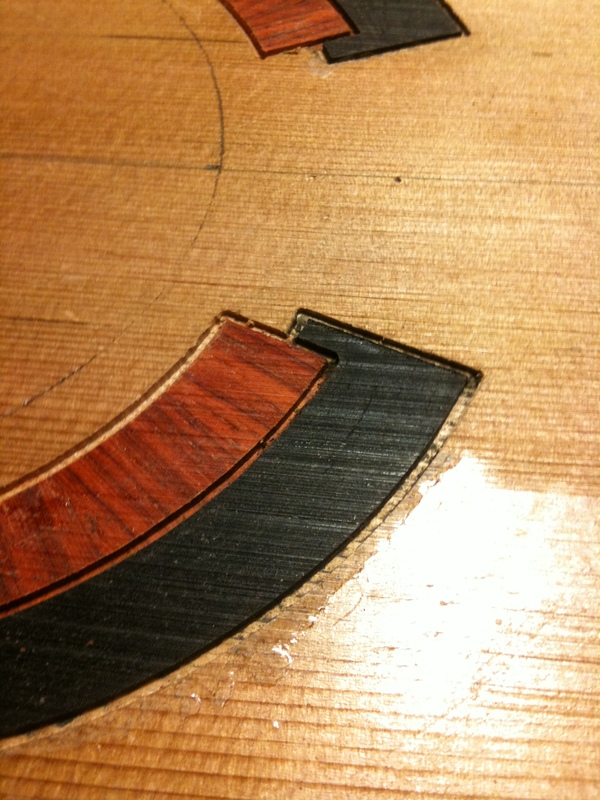 For #8, I got the profile (SJ w/cutaway) cut out. 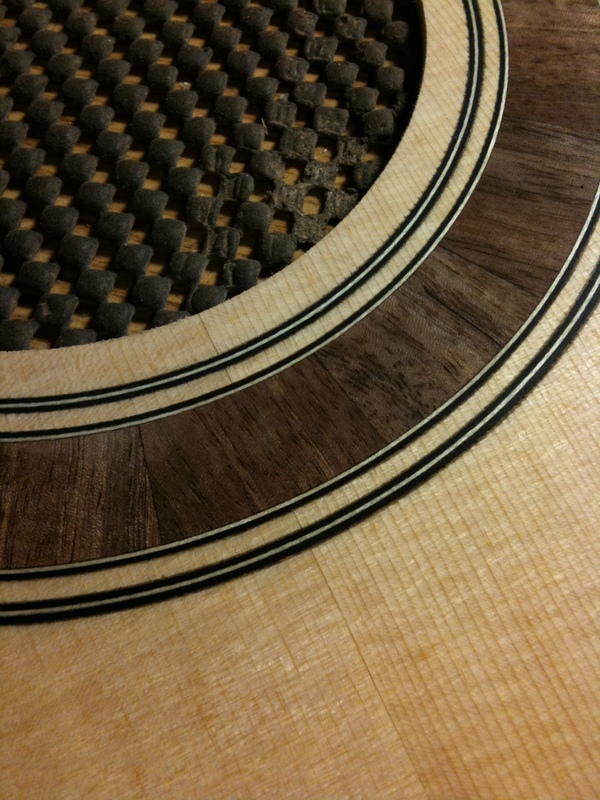 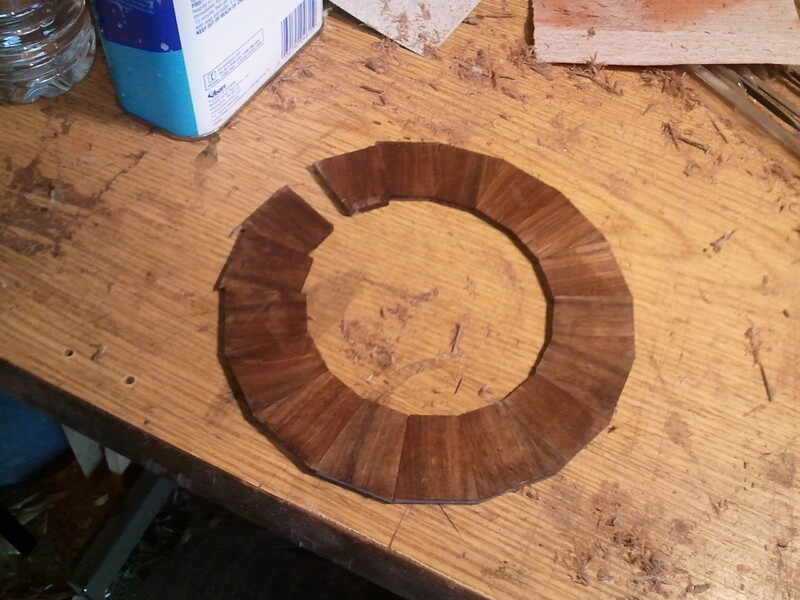 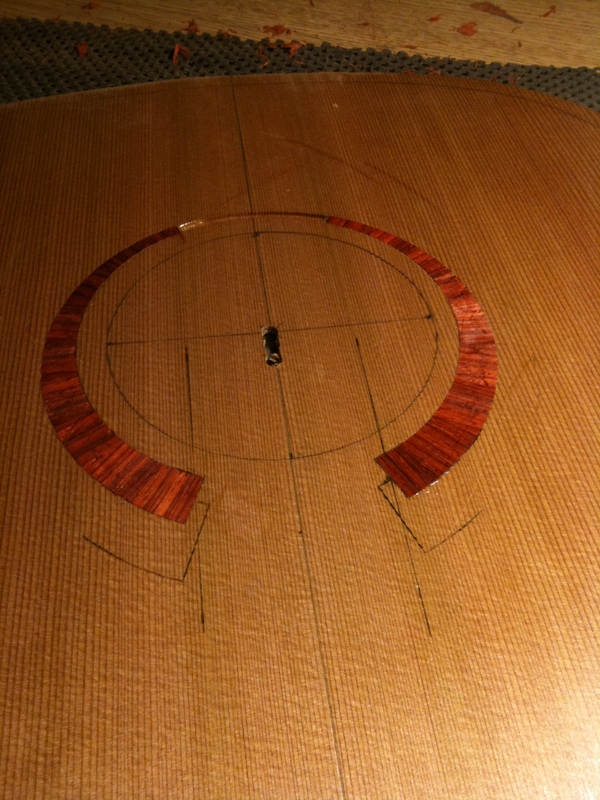 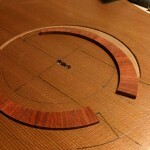 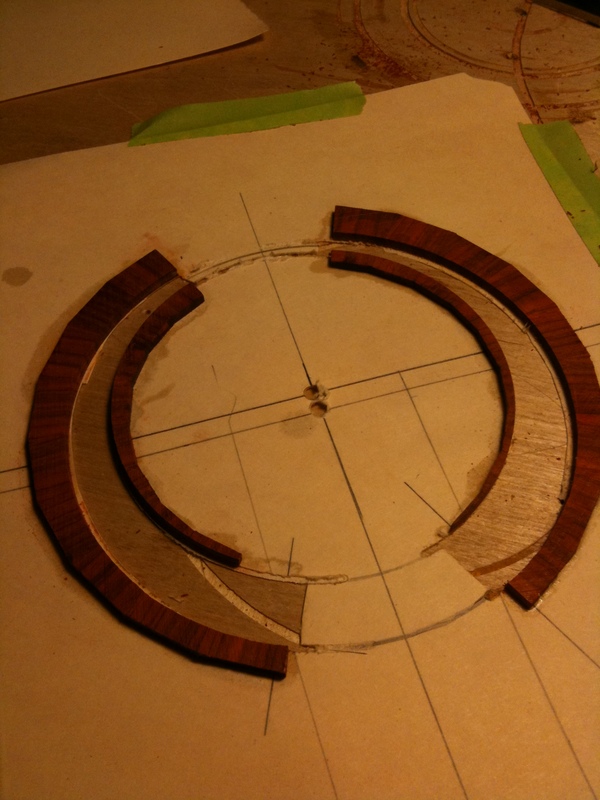 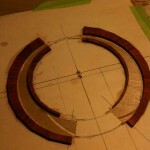 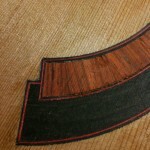 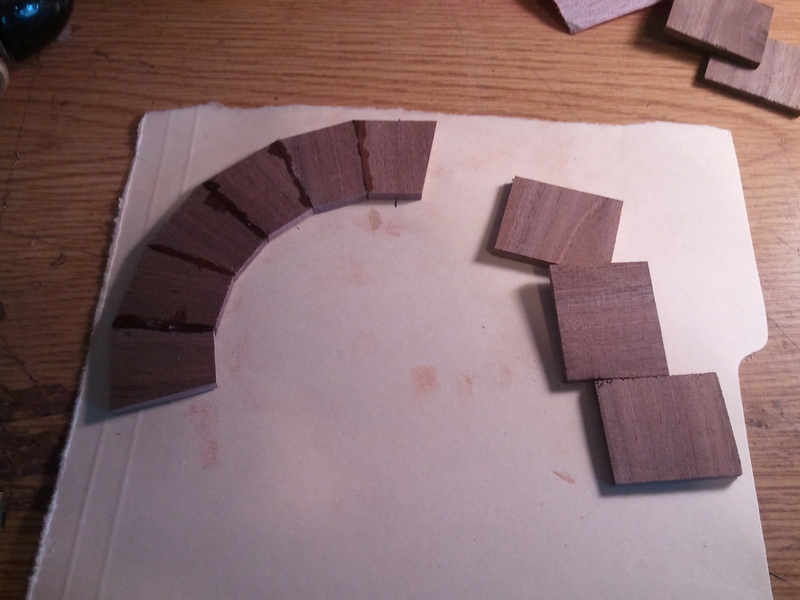 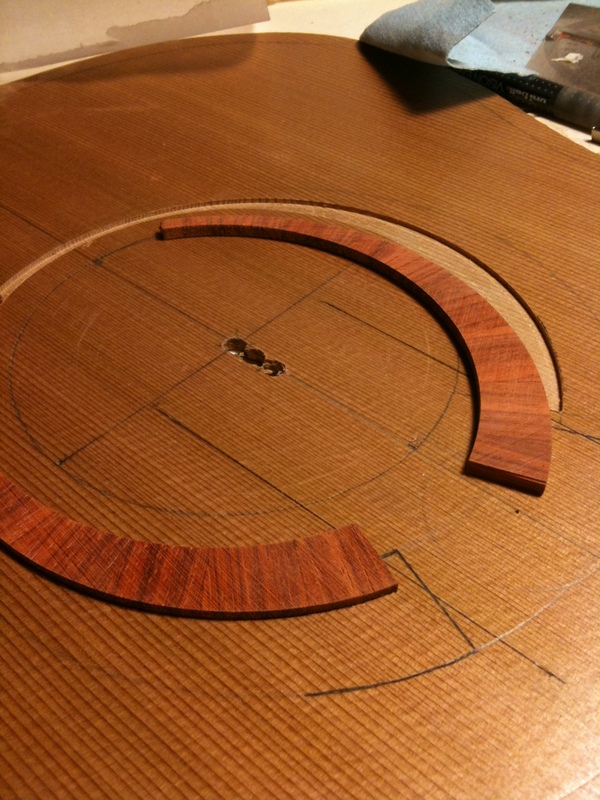 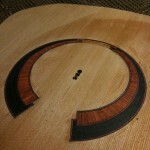 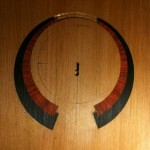 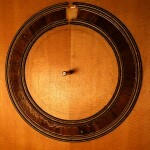 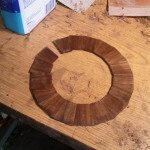 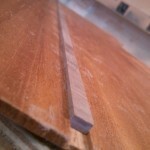 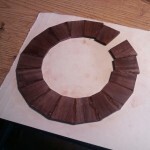 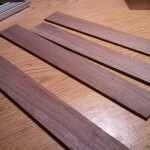 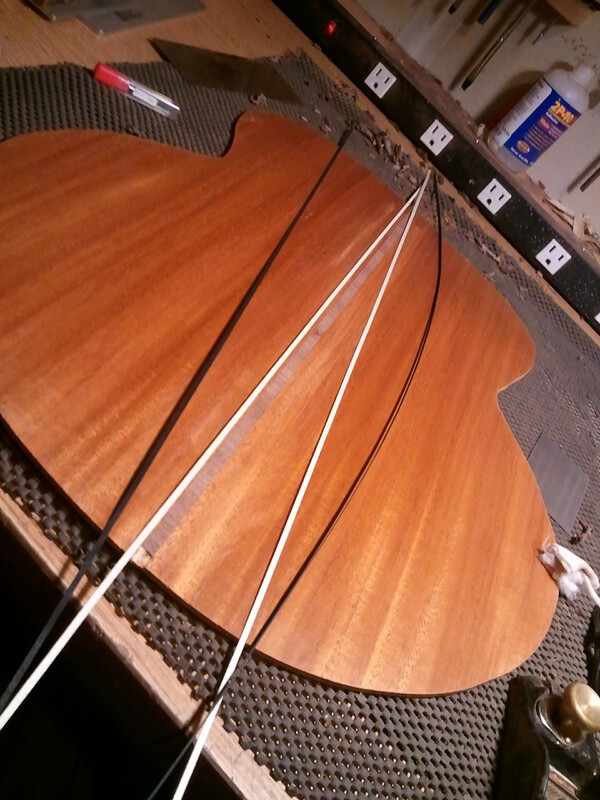 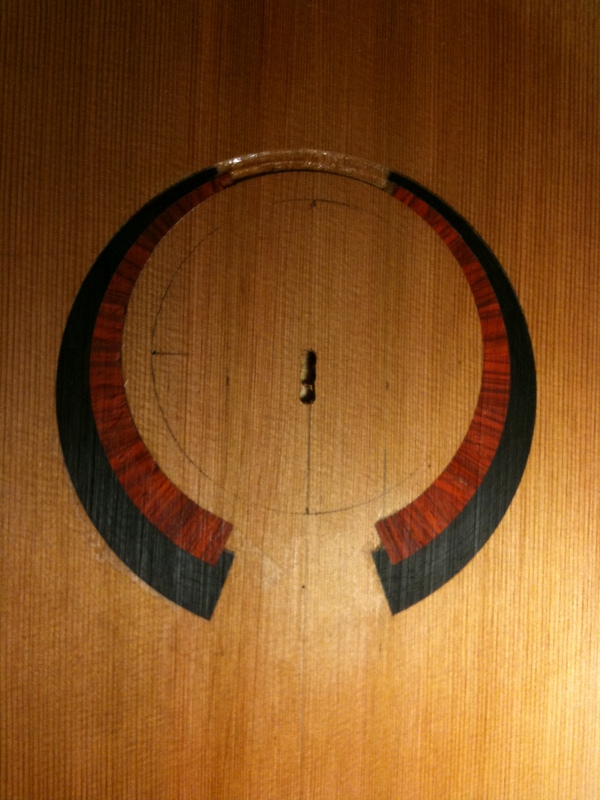 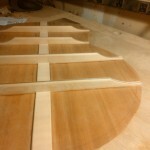 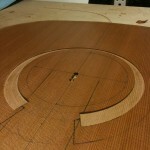 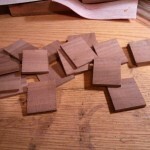 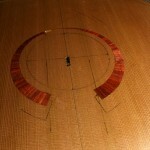 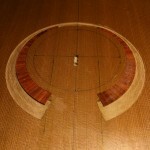 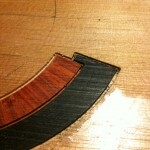 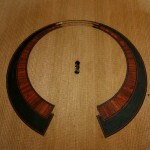 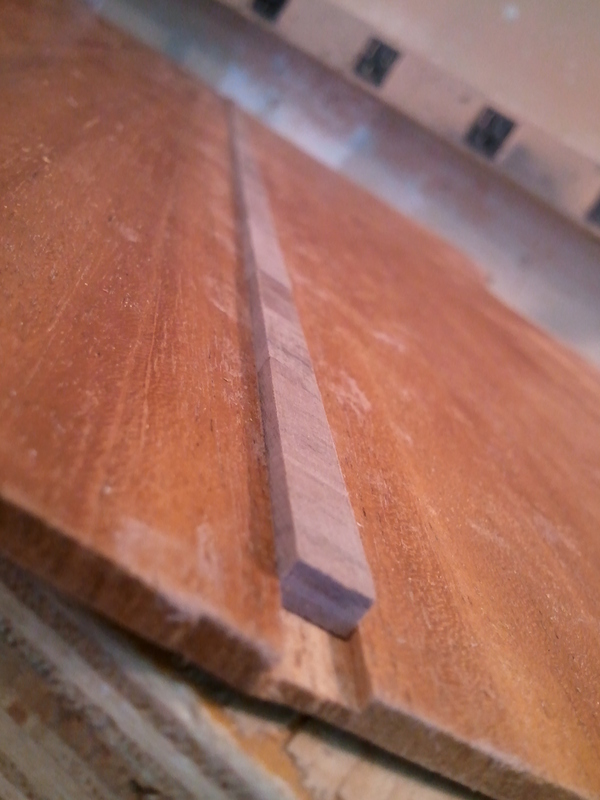 I have the main part of the rosette routed out (black walnut). 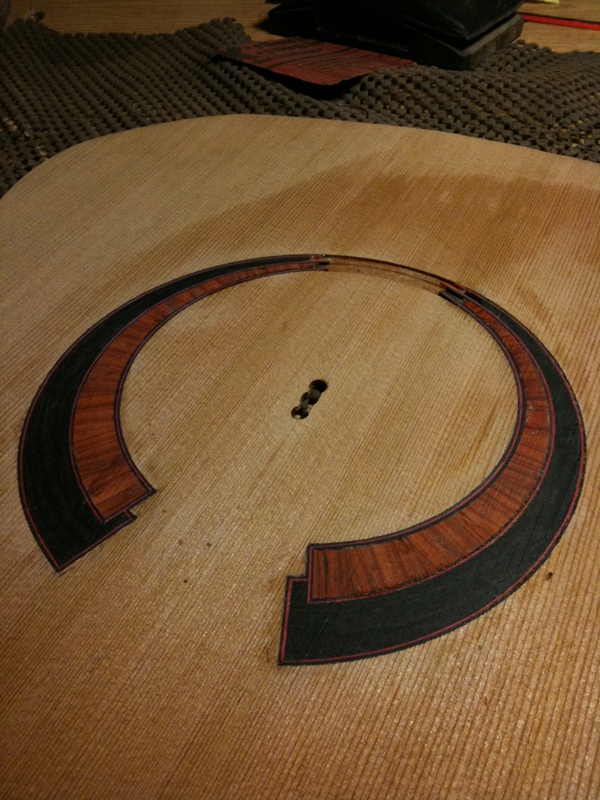 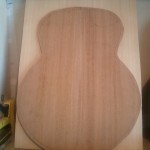 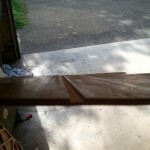 I think I am going to do a cool pearl inlay in it, but I will leave that as a surprise.